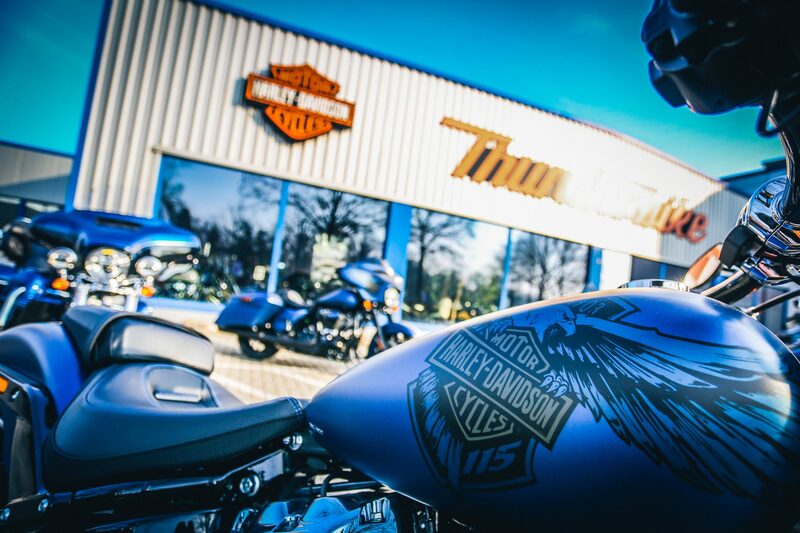 It’s our 115th anniversary and we’re celebrating it in the way we care most – building very special anniversary bikes. 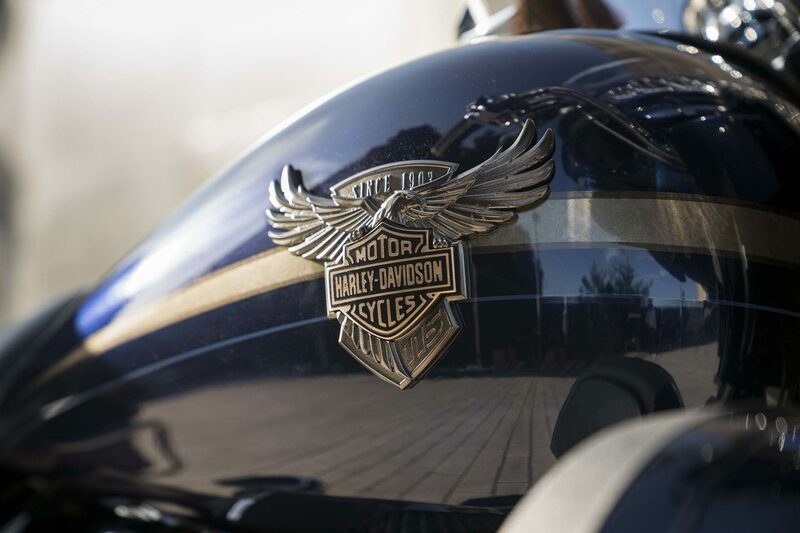 In 1903, the first three Harley-Davidson motorcycles were produced and sold. 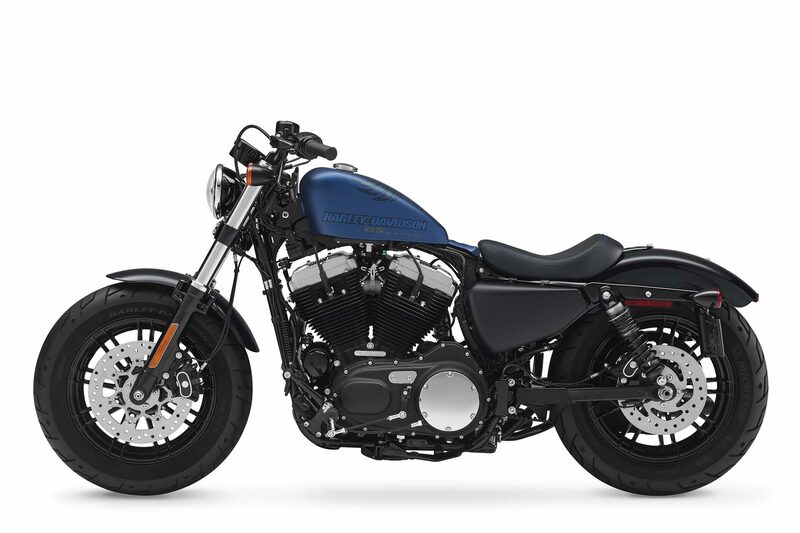 To celebrate its 115th anniversary in 2018, the Motor Company will be presenting ten elaborately enhanced 115th Anniversary models from the Sportster, Softail and Touring ranges, which feature special features and are presented in two extraordinary Anniversary liveries with corresponding Anniversary Graphics and emblems. The number of 115th Anniversary models is strictly limited and each machine carries the serial number of the respective special model, which is applied in different places depending on the type. 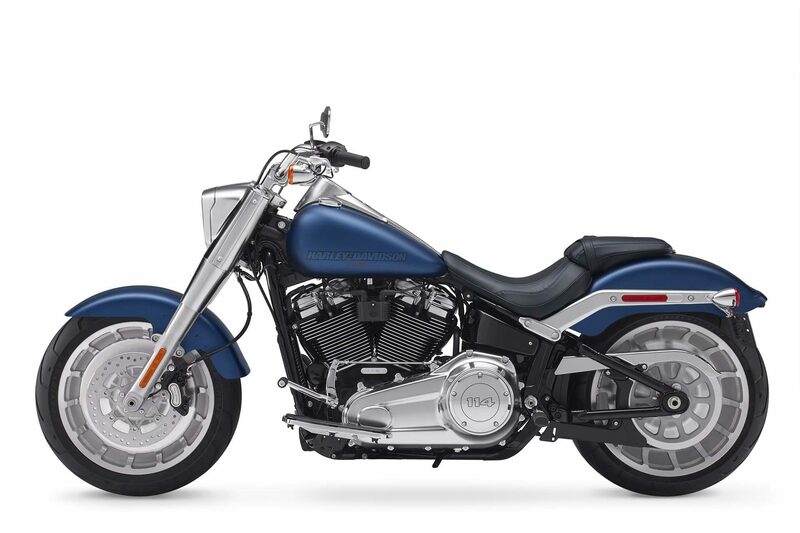 Numerous other features distinguish the 115th Anniversary models from their respective series counterparts. 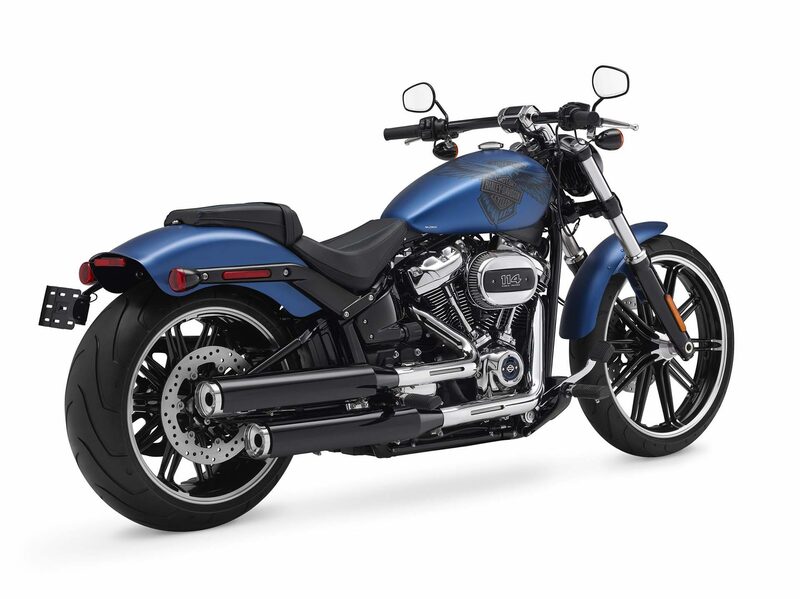 Depending on the model, these include, for example, perforated seats with color-coordinated seams, cloisonné tank medallions or special Anniversary Tank Graphics as well as the Anniversary insignia on the air filter or ignition cover. 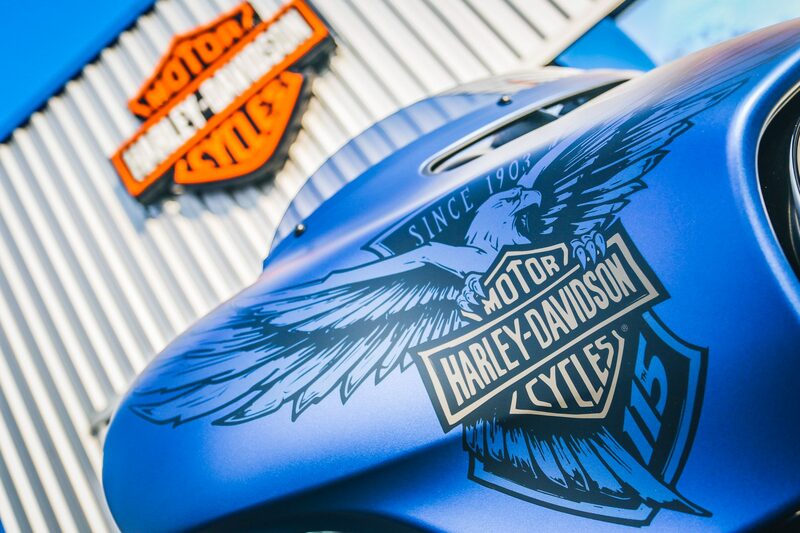 As usual, Harley-Davidson offers the appropriate H-D 115th apparel for the Anniversary models, which is available in the Thunderbike online shop. 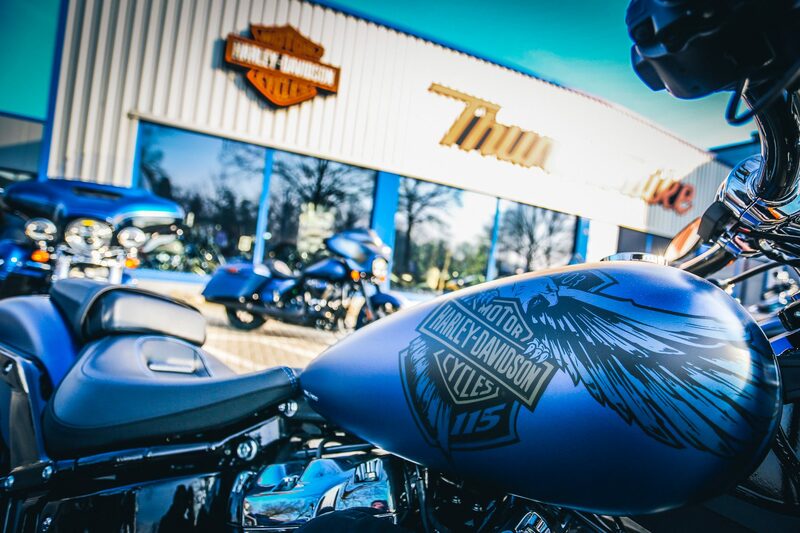 Harley-Davidson celebrates its 115th anniversary with Anniversary insignia that reflect contemporary trends in customization: as an anniversary hue for the models whose type code ends on “ANX”, the company created the new matt finish Legend Blue Denim, with a dark finish combined. 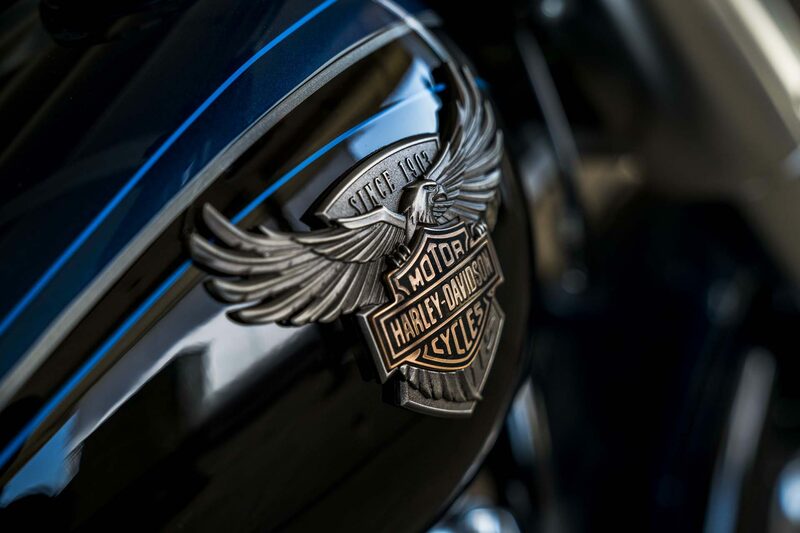 In addition, in the style of tattoos designed graphics that present an eagle along with the Bar and Shield logo. 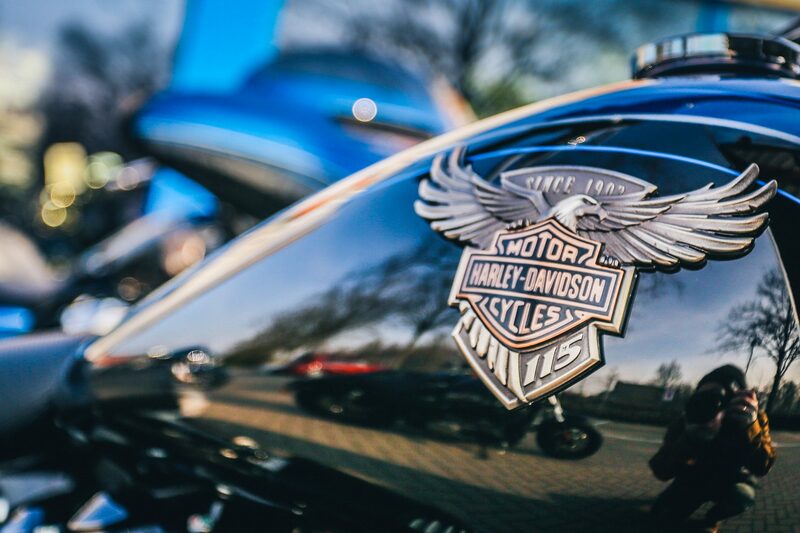 They adorn the right side of the fuel tank, while a Harley-Davidson “115th Anniversary” lettering is emblazoned on the tank’s left flank. 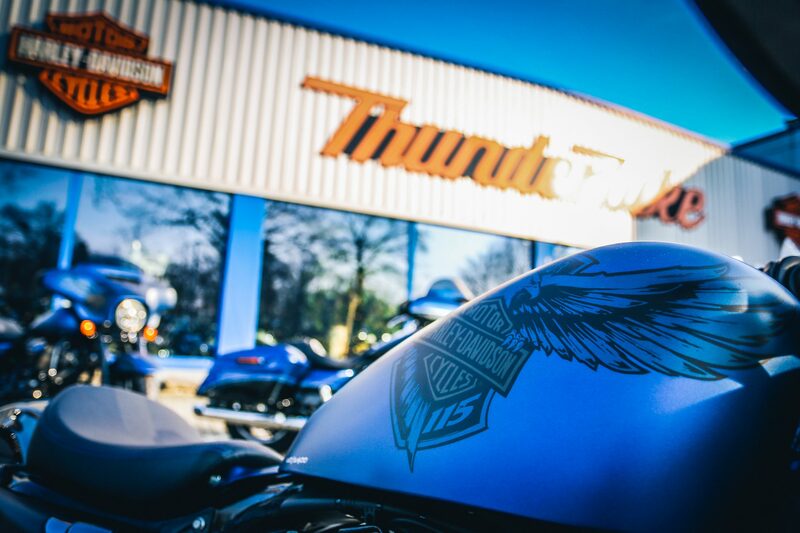 On the panel of the 115th Anniversary Street Glide Special you will also find the asymmetrically applied depiction of the eagle with the Bar and Shield logo. 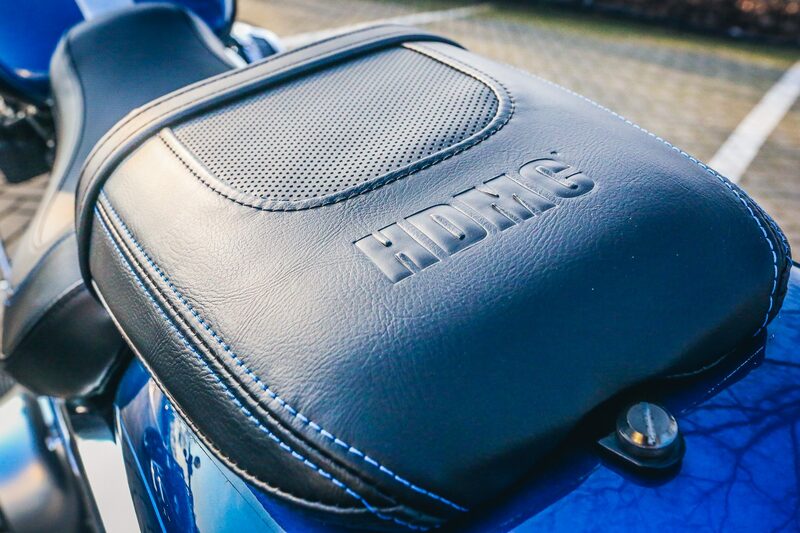 The subtle perforation of the seat cover, its blue seams and the embossed “HDMC” lettering are further features of the anniversary models. The numbering of the machines is applied by hand at the factory. 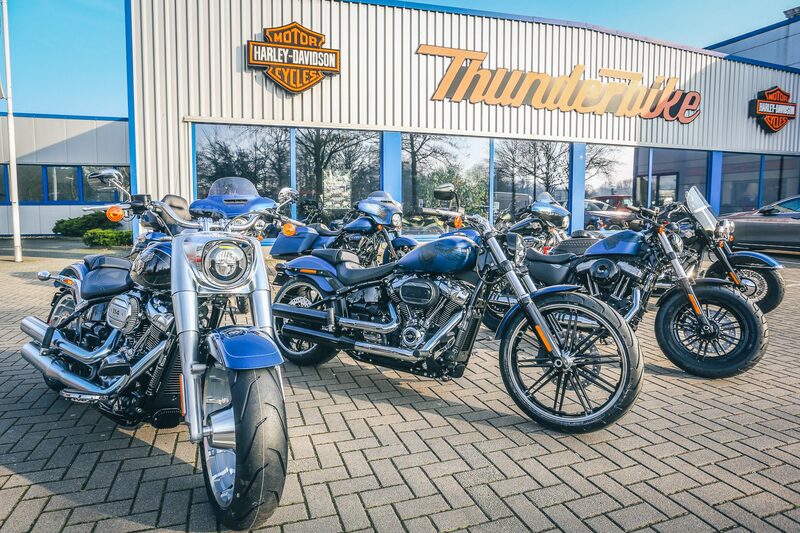 In the Denim Anniversary variant, Harley-Davidson offers the models Forty-Eight, Fat Boy 114, Breakout 114 and Street Glide Special. 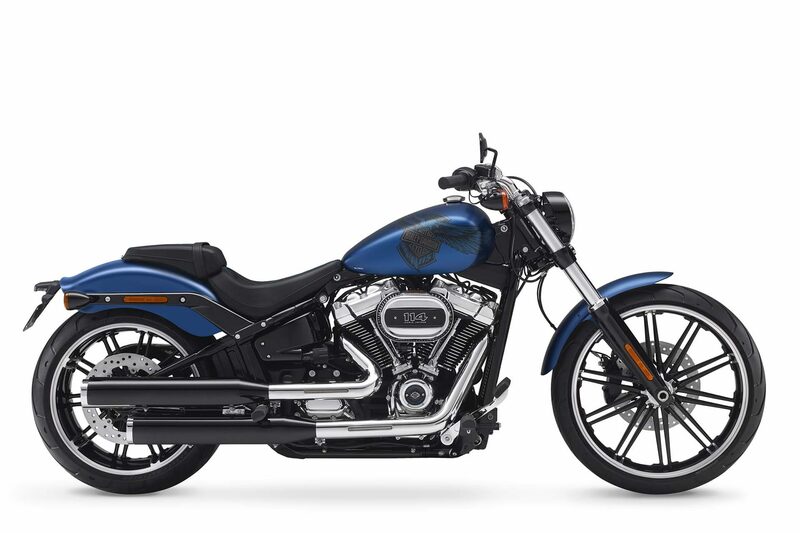 For models whose type code ends with “ANV”, the Motor Company combines the redesigned Anniversary color Legend Blue with the classic black Harley color Vivid Black. Triple Pinstripes crown this Two Tone paint version and emphasize the individual contour of each machine from the front to the rear. 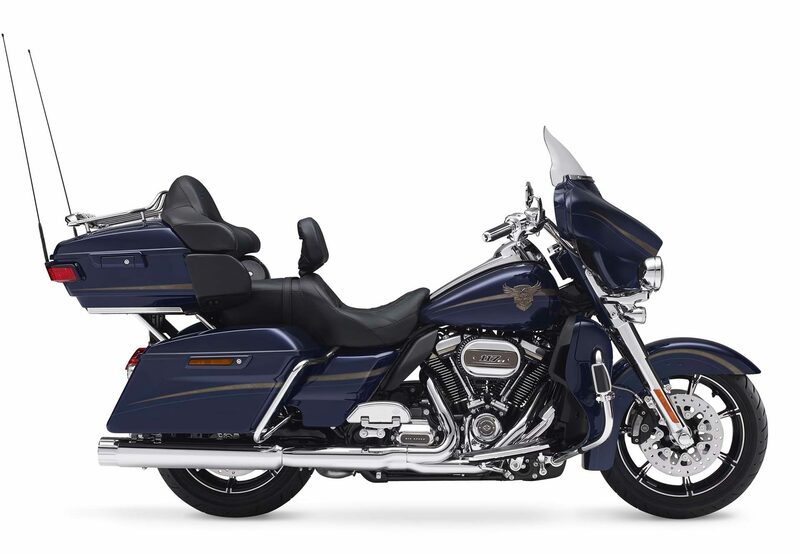 Symmetrical to the Pinstripes, the flanks of the Tour-Pak also carry a “115th Anniversary” logo on the Tri Glide Ultra and Ultra Limited models. The cloisonné tank medallion of these machines shows an eagle wearing the Bar and Shield logo in its claws. The elaborate processing of the metal testifies to great attention to detail. 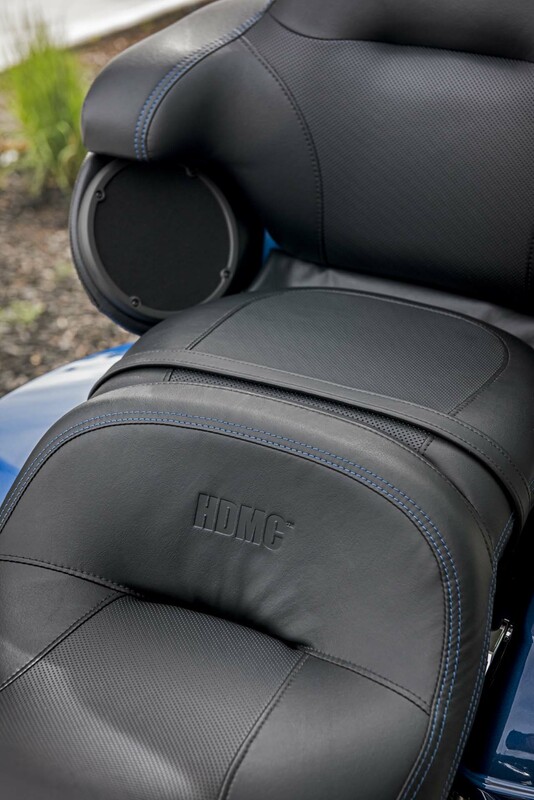 The seat cover of these models was perforated and provided with blue stitching and embossed “HDMC” lettering. 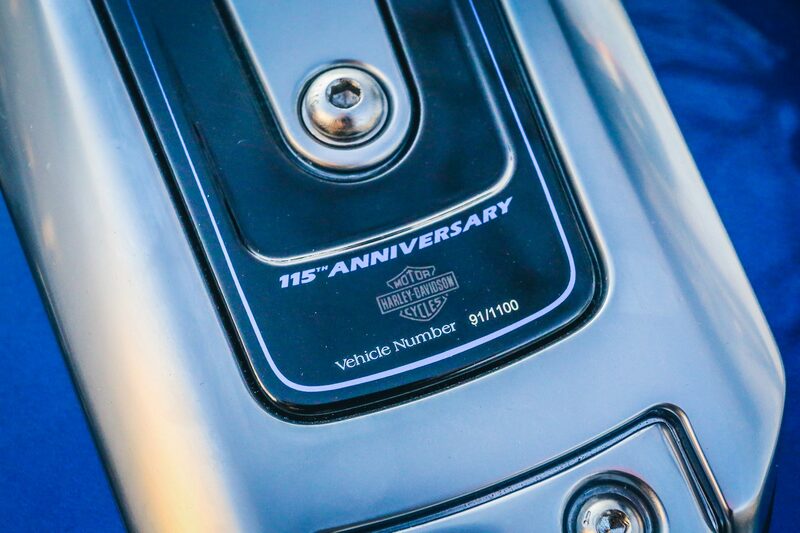 “115 Anniversary” logos are also attached to the fueling console, ignition cover, and air cleaner housing. 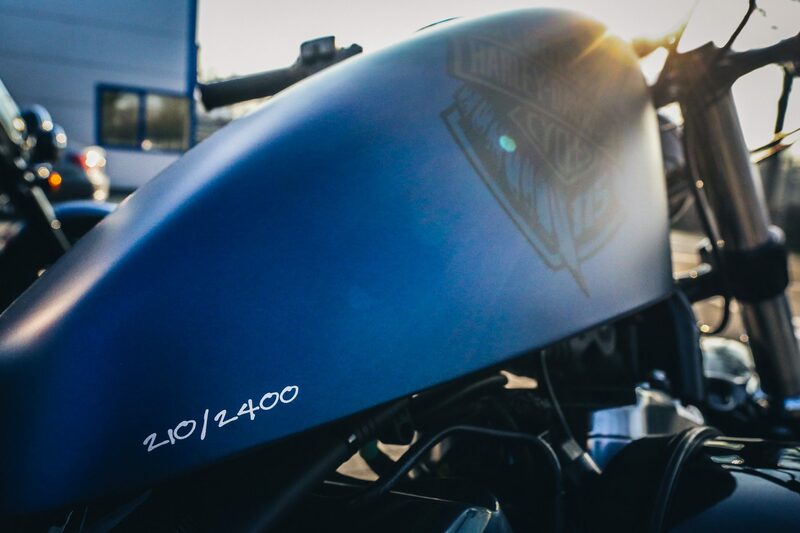 Depending on the model, the serial number of the ANV types is laser engraved in different areas of the bike. 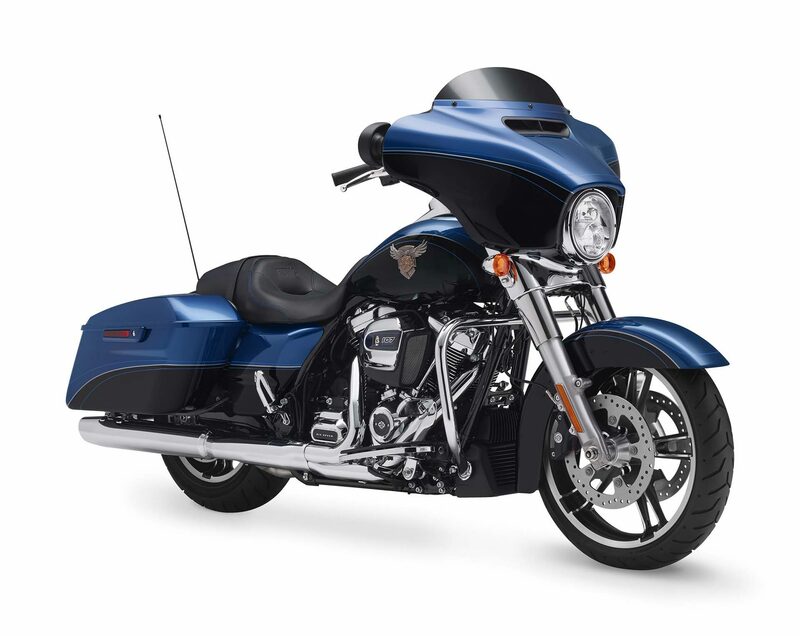 In this Anniversary variant the models Fat Boy 114, Heritage Classic 114, Street Glide, Ultra Limited and Tri Glide Ultra are available. 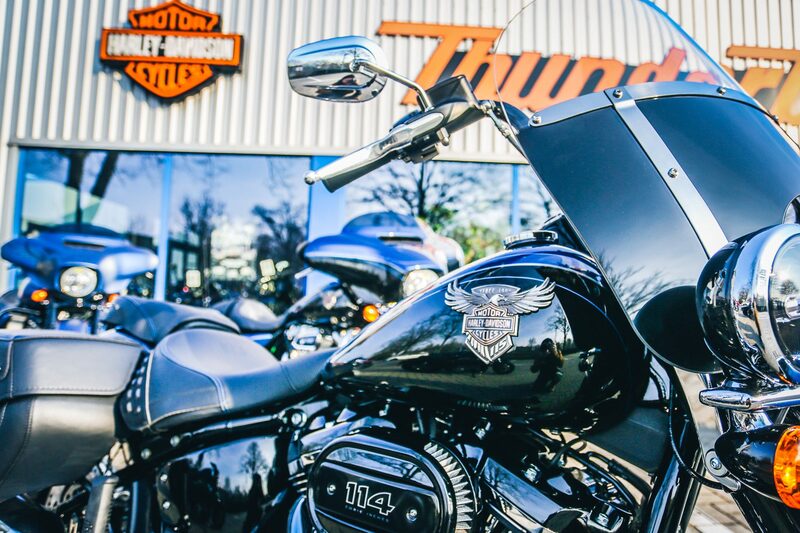 The new 115th Anniversary Breakout 114 is one of the models Harley-Davidson celebrates its 115th anniversary. 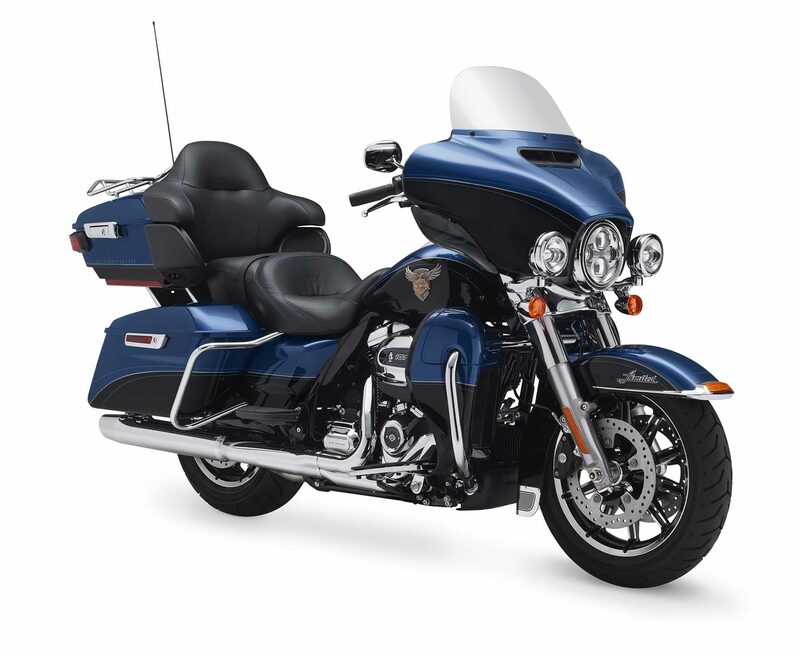 It has all the features that already characterize the base model, the Breakout 114. 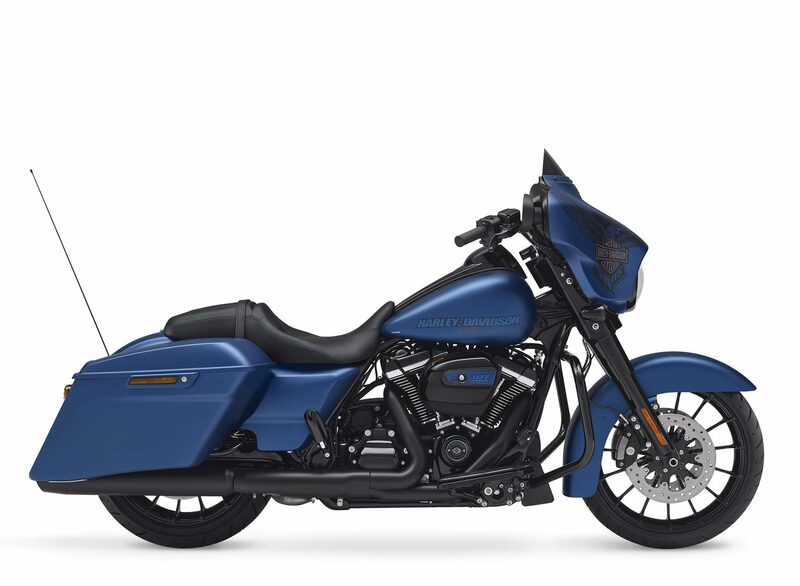 In contrast to that, however, the 115th Anniversary Breakout 114 is painted in the Legend Blue Denim color reserved for the anniversary editions. 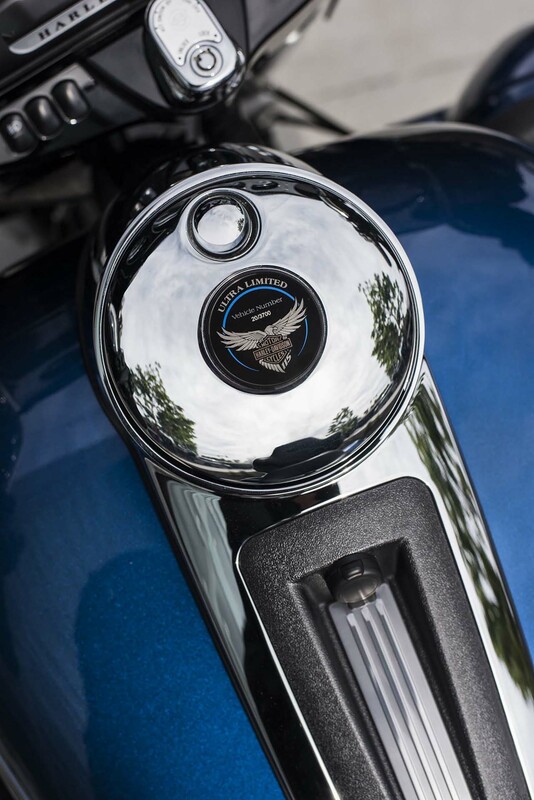 The right side of the new, sleek 13.2-liter tank adorns the image of an eagle with a Bar and Shield logo, on the left a “115th Anniversary” lettering on the anniversary of the Motor Company. The surface of the seat was subtly perforated. Their seams are designed to match the paint in blue. 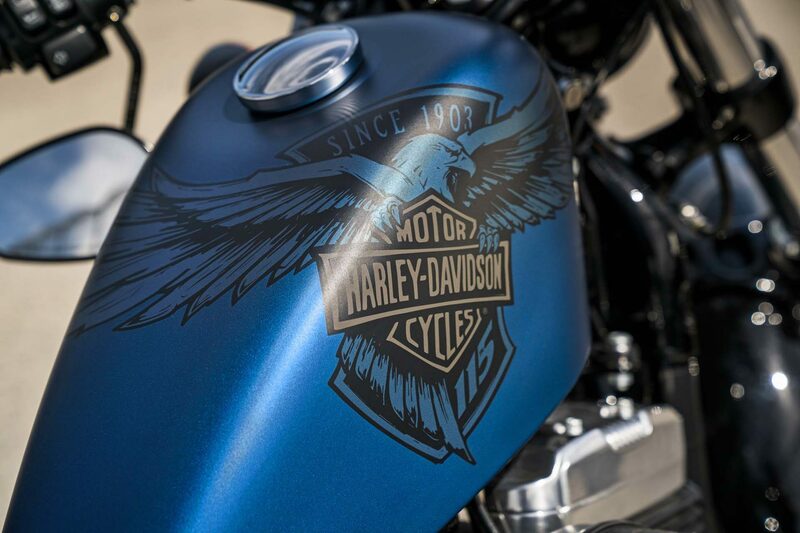 Also in blue is the lettering “Harley-Davidson 115th Anniversary” on the glossy black coated ignition cover. 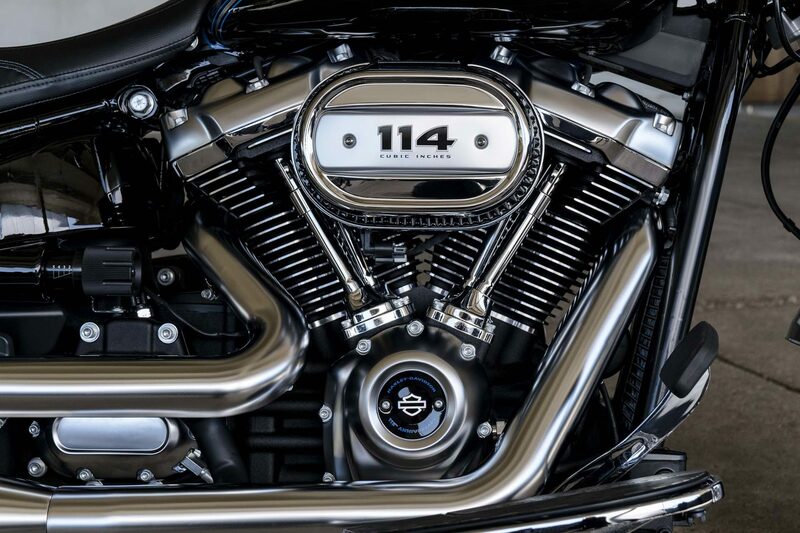 As in the case of the Breakout 114, a Milwaukee Eight engine with 1868 cc displacement and two balance shafts, held in black and chrome, provides propulsion. It develops an output of 69 kW (94 hp) at 5020 rpm and a maximum torque of 155 Nm at 3000 rpm. The Cruise Drive six-speed gearbox and a robust timing belt transfer the power to the road. 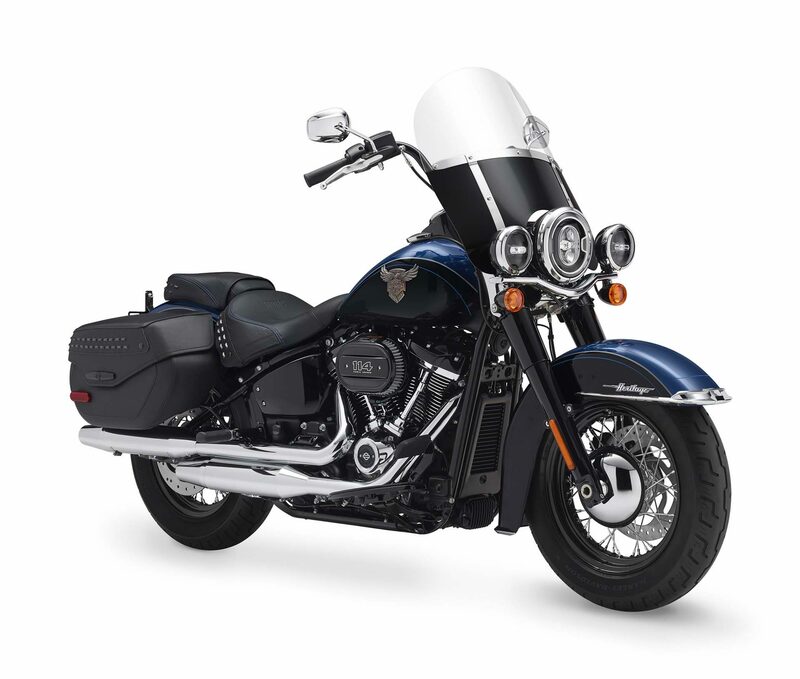 The engine and transmission are rigidly embedded in the new, extra-stiff Softail chassis in the rigid frame look, which is equipped with new, perfectly tuned suspension components. At the rear, a new triangular rocker is used, which was equipped with a new, concealed central strut. Its spring preload can be adjusted hydraulically via an externally arranged rotary control. At the front there is a new “Dual Bending Valve” telescopic fork with a 49 mm stanchion diameter, which is set at a 36 ° fork angle when stretched. 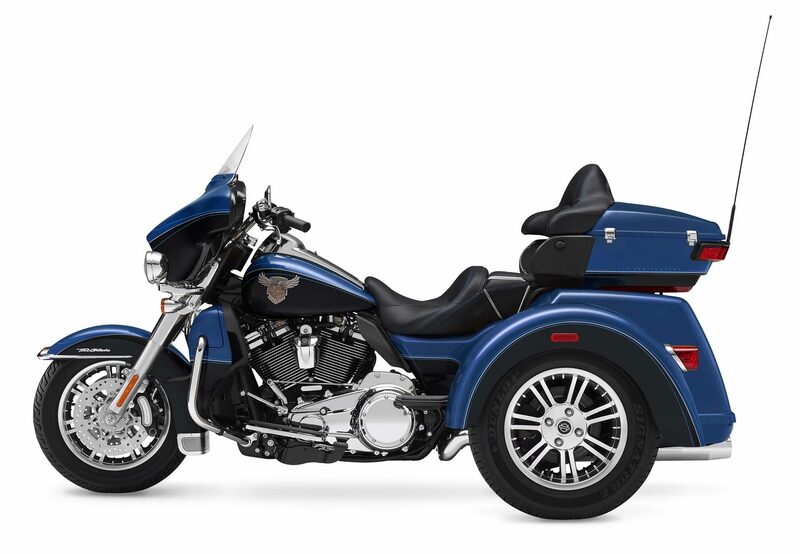 In addition to handling and comfort, the tilting freedom benefits from the new chassis. It grew by 3.5 percent compared to a 2017 breakout, while weight could be reduced by around 15 kilograms. 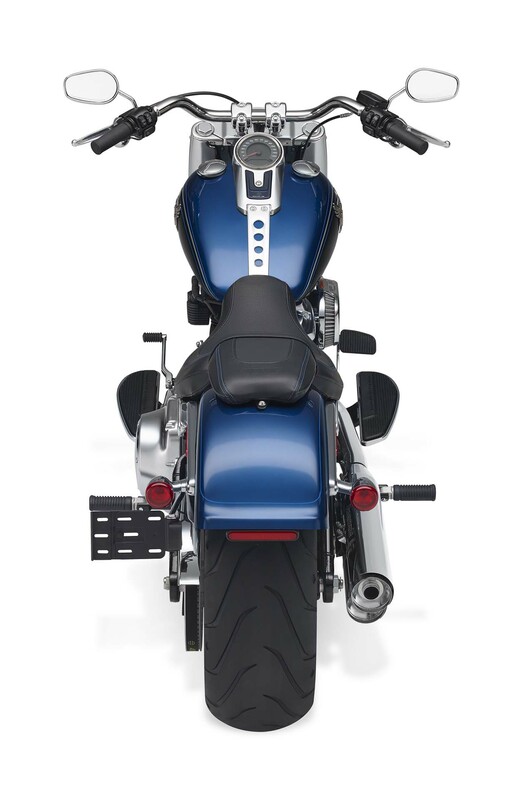 At the front and rear rotate black “Gasser II” cast wheels with ten double spokes and polished rim edges. 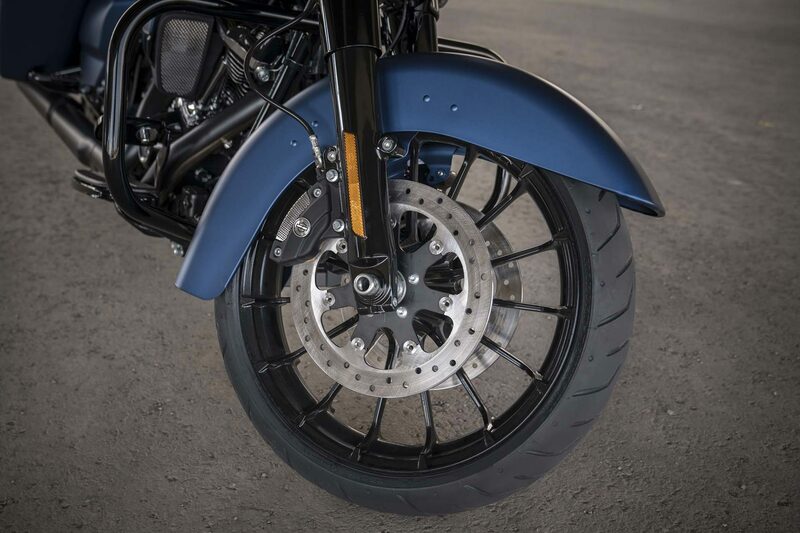 The 21-inch front wheel is frosted with a Michelin 130, the rear is a 18-inch 240 Michelin used. To emphasize the visual impact of the wheels, both fenders were chopped. A powerful ABS-assisted brake system with two brake discs and new rear brake calliper is responsible for the deceleration. 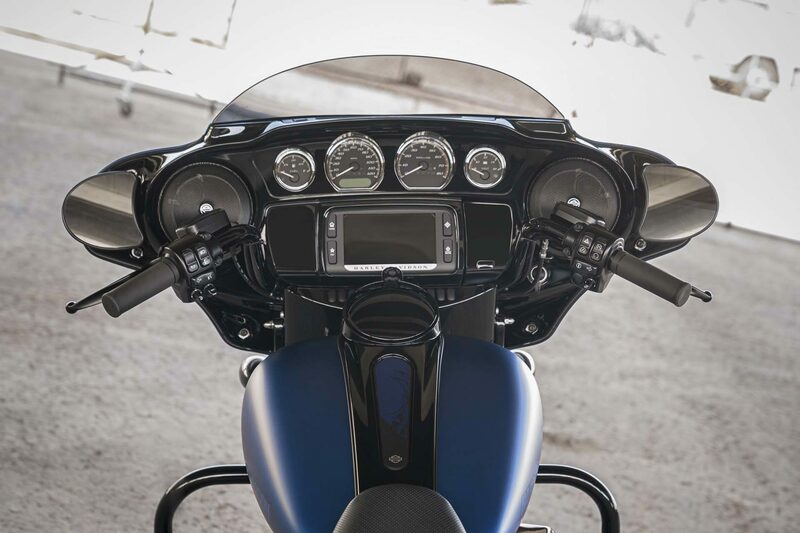 The top of the tank was kept clean and the tachometer is an LCD display integrated into the handlebar clamp. 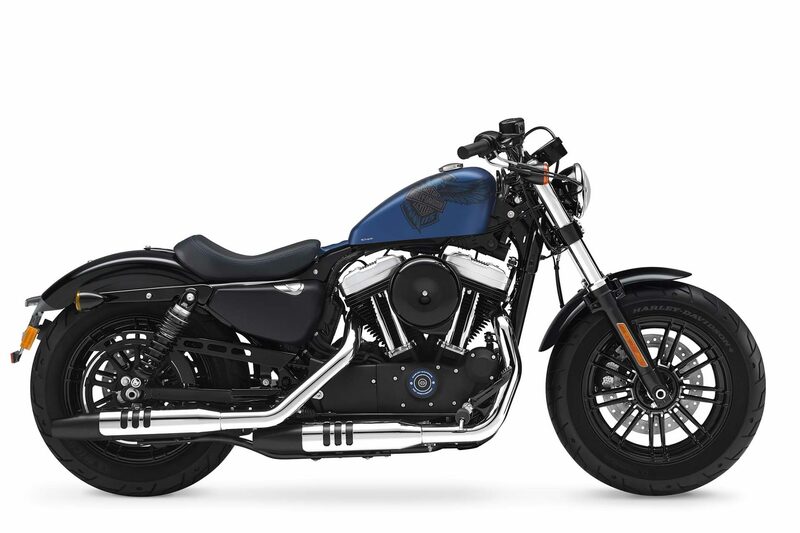 The seating position is defined by the low-seated bench with removable pillion pad, the pre-routed footpegs and the flat Drag Style handlebar. The latter is as black as the turn signals, the side covers, the fender holder, the dip tubes and the new, flat and very bright LED headlights. 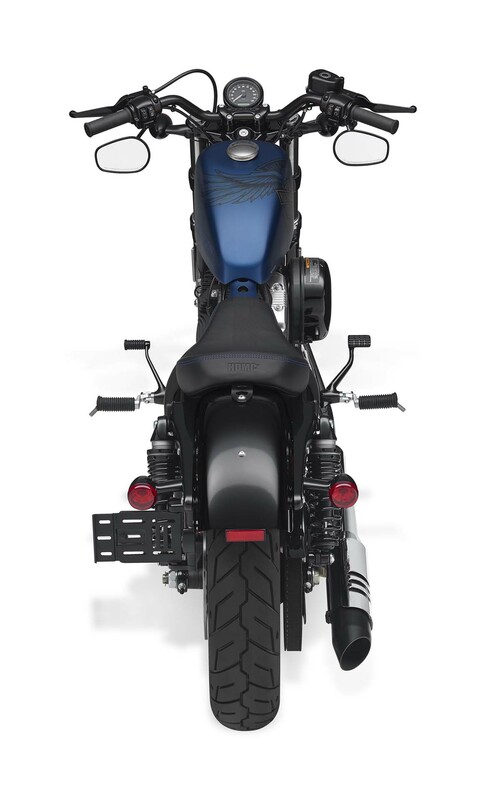 At the rear, the turn signals assume the function of the rear and brake lights. The machine comes standard with security system including immobilizer and alarm system. No ignition key is required to start it, as a keyless ignition system is on board. A USB port is available for charging mobile devices. 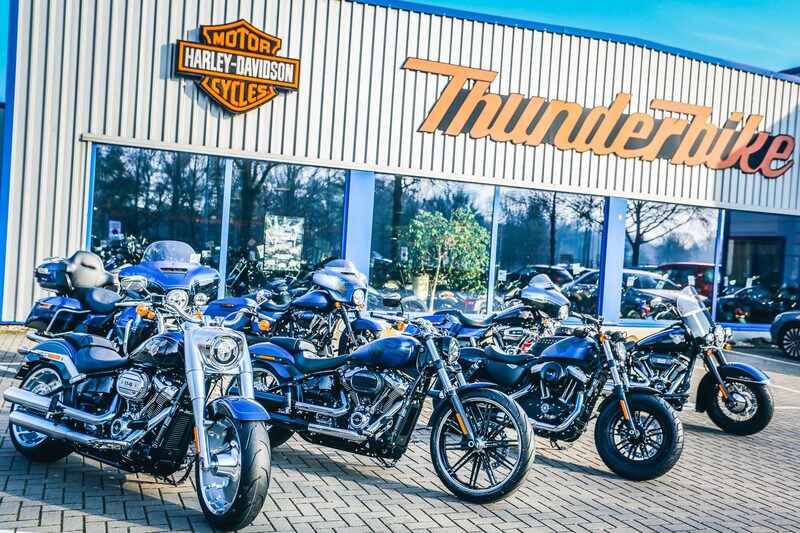 The production of the 115th Anniversary Breakout 114 is limited to a total of 1900 units, 470 of which are destined for Europe, the Middle East and Africa. If you appreciate something special, you will love this unique machine. 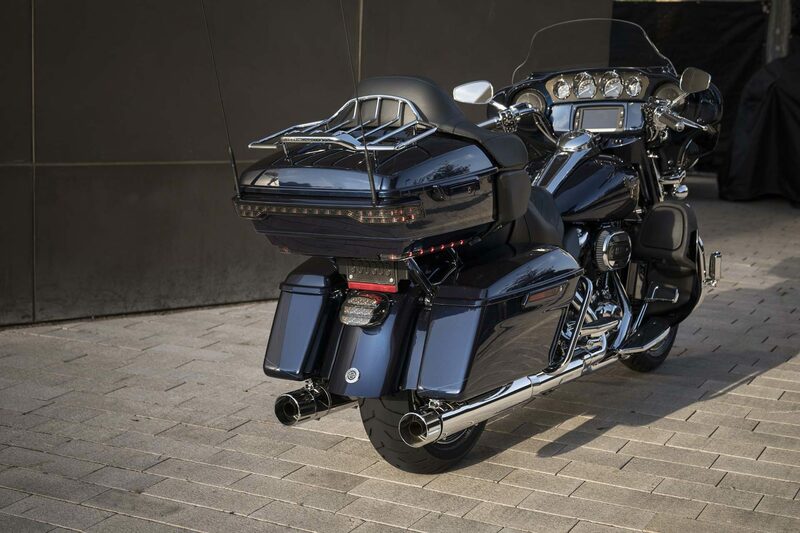 On the occasion of the company’s 115th anniversary, Motor Company is offering the already exceptional CVO Limited in this special version, which is manufactured in very small quantities. 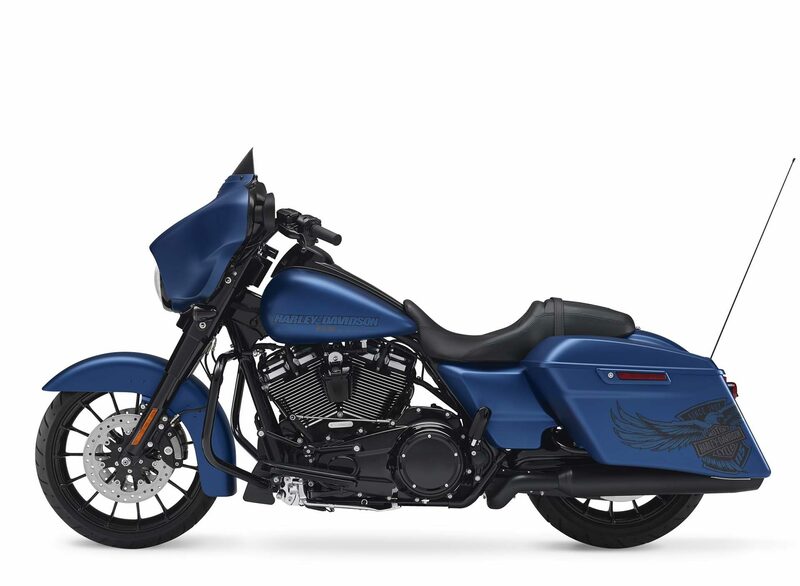 Exclusively for this motorcycle the designers designed the Anniversary color Odyssey Blue and refined it with Anniversary Graphics. 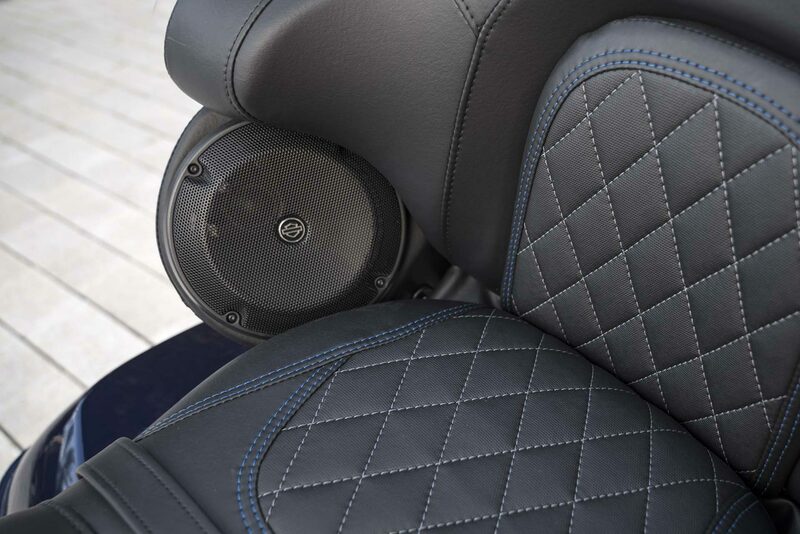 The seat was quilted diamond-shaped and provided with blue stitching. 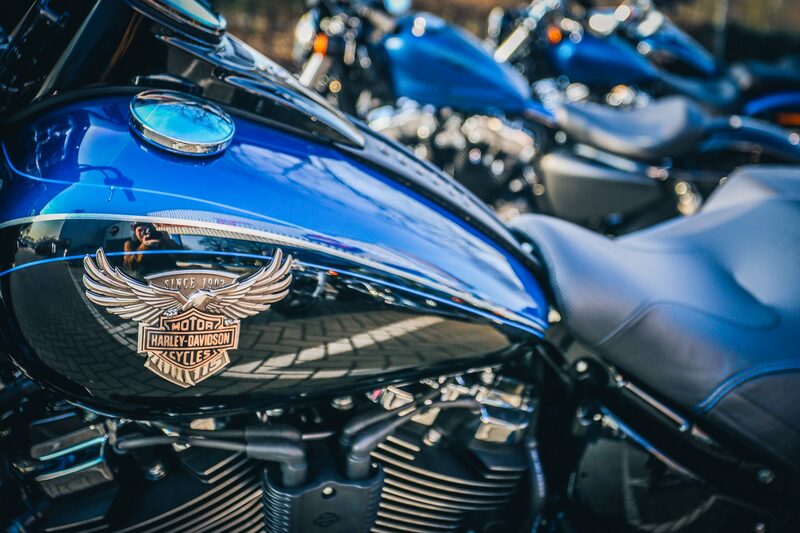 Artfully crafted from various metals “115th Anniversary” medallions adorn the tank flanks. Among the numerous color-coordinated components are the inserts on the tank console, which also shows the serial number, and the air filter housing. The latter also points to the anniversary with a “115th Anniversary” lettering. 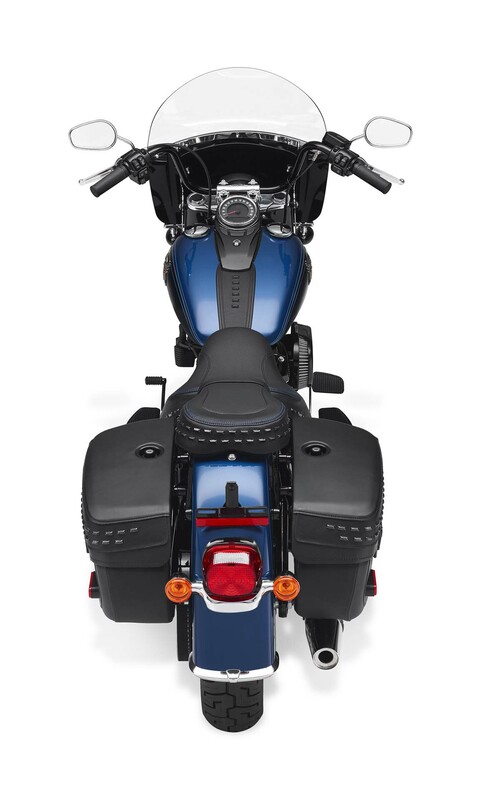 The interior trim has been kept in the classic Harley color Vivid Black. 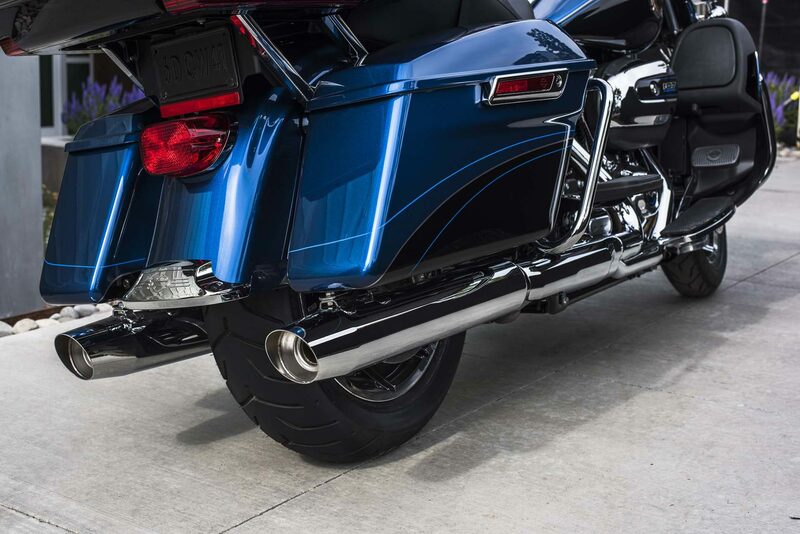 Special CVO end caps beautify the exhaust. 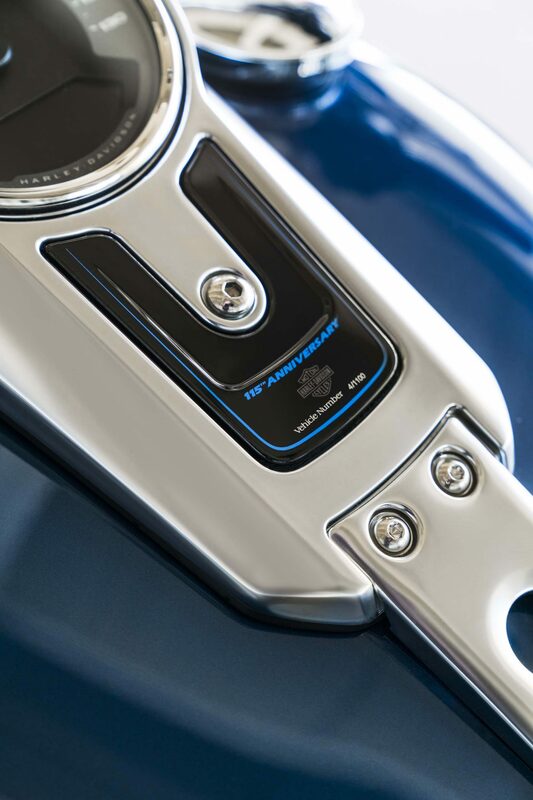 Subtle Scorched Chrome finish adorns the ignition cover, the badge on the gearbox cover, the clutch cover and the inserts of the fairing, the air filter housing and the horn. 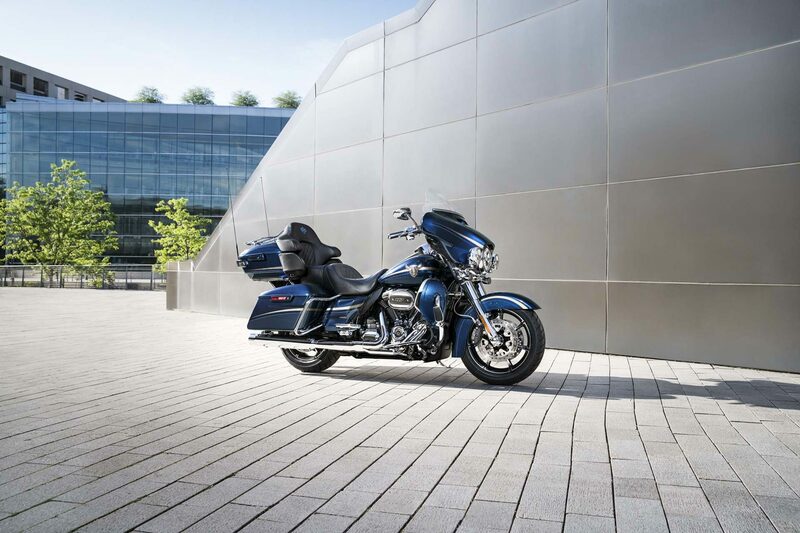 The exclusive engine is powered by the largest-capacity Big Twin Harley-Davidson offers. 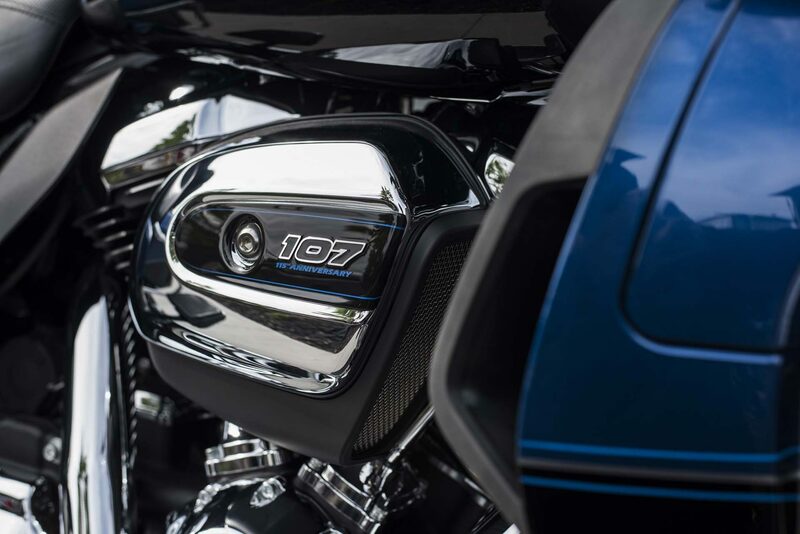 It is the Twin Cooled Milwaukee Eight 117, an engine used exclusively in CVO models and designed for the 115th Anniversary CVO Limited in Black and Chrome finish. The 1923 cc V2 develops 78 kW (106 hp) at 5450 rpm and releases a torque of 166 Nm at 3500 rpm. A “fan” air filter provides the air supply, the exhaust gases escape via a specially adapted to the large-volume engine exhaust system. 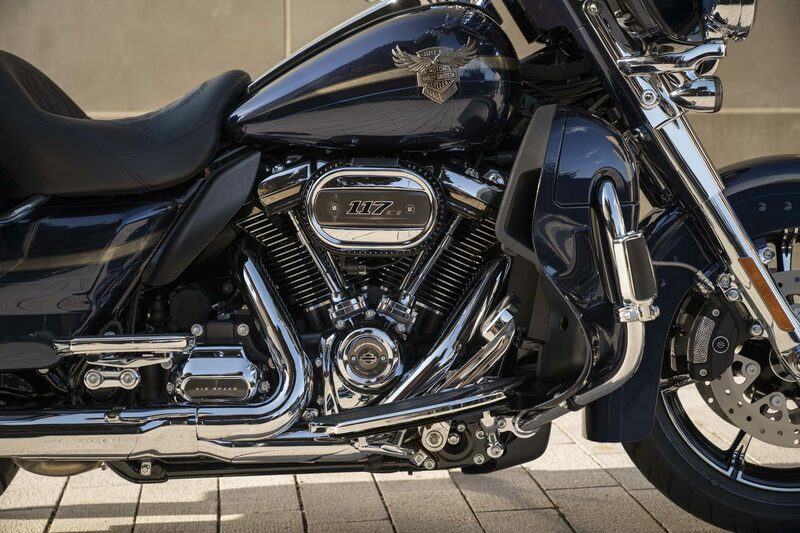 Harley-Davidson connects the V2 to the Cruise Drive six-speed gearbox via a high-performance hydraulic Assist and Slip clutch and hangs it up in a vibration-resistant Touring frame. 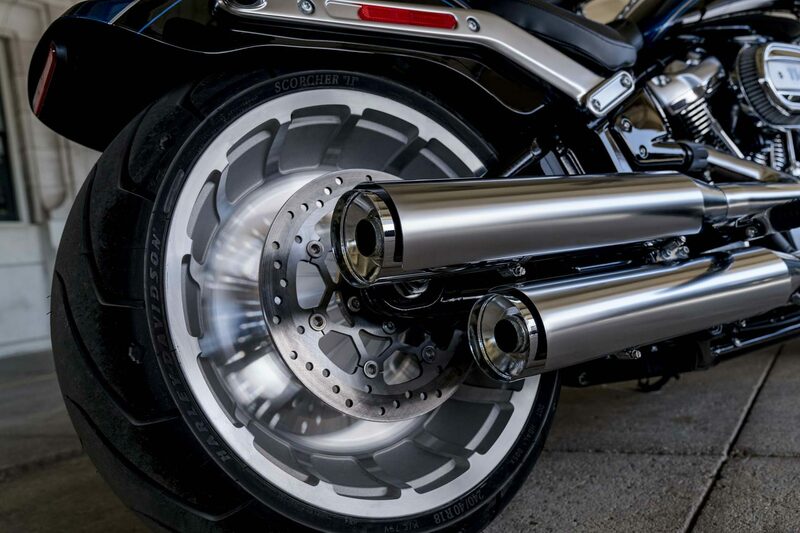 The front 17-inch “slicer” custom bike is guided by a stiff 49-millimeter telescopic fork that works with “Dual Bending Valve” technology, the 16-inch “slicer” rear wheel is stored in a swingarm with emulsion Struts whose spring base is adjustable with a rotary knob from the outside. The deceleration is provided by an ABS-assisted brake system with three brake discs and electronic brake force distribution. 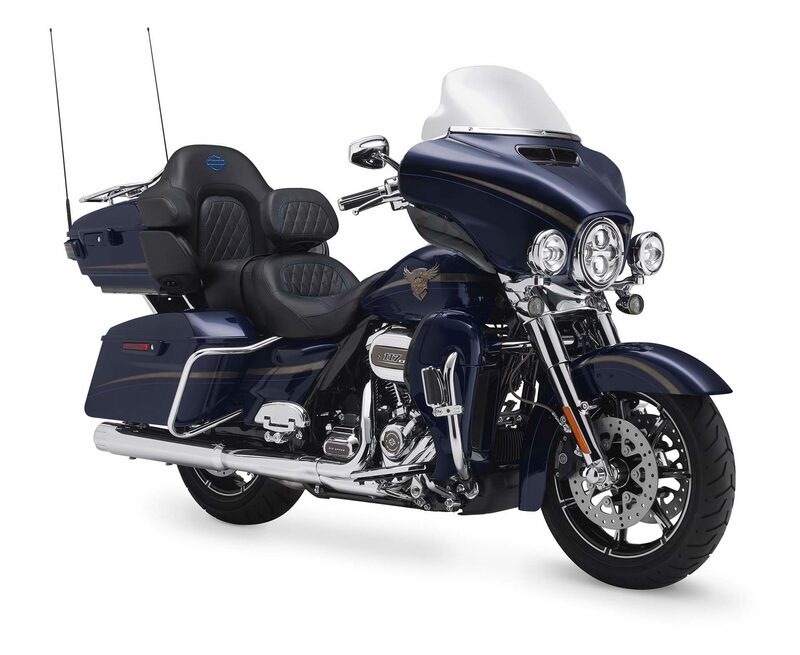 Maximum comfort for the crew is ensured by the sprung and separately heated seat with pillion back and armrests and driver’s backrest. Lots of luggage space is provided by the two suitcases and the Tour-Pak, which have removable inner pockets and are coupled to the central locking system. Under the “Batwing” -Verskleidung particularly bright Daymaker LED headlights and fog lights are attached. The taillight and turn signals were also implemented using LED technology. For infotainment draws the boom! Box 6.5 GT system with a power of 150 watts, four speakers, color touchscreen, navigation system, voice control in nine languages ​​and Jukebox specialist. 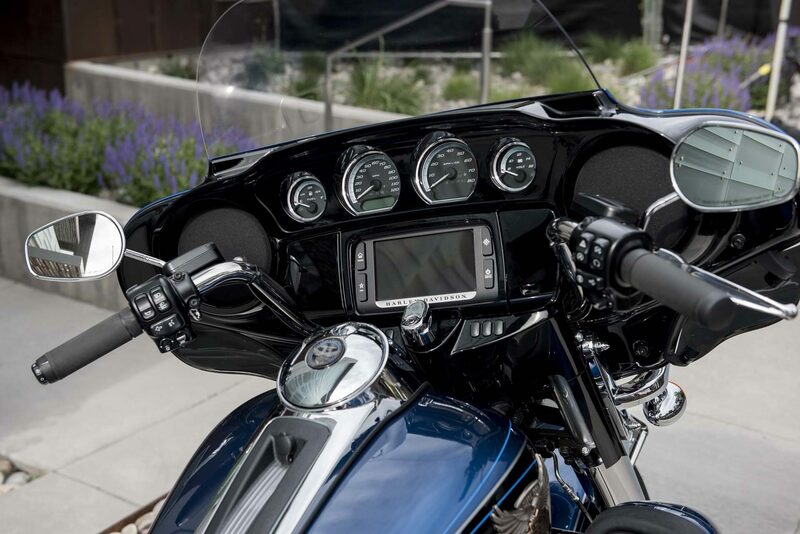 In the new model year, Harley-Davidson added a wireless headset interface with two headsets, allowing wireless communication from helmet to helmet. 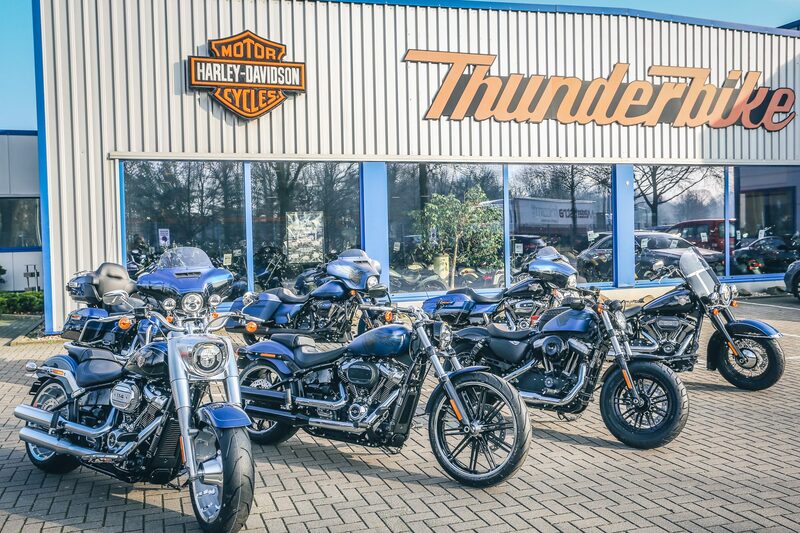 Only around 50 of the 1,200 units produced are expected to be sold in Germany and Austria. 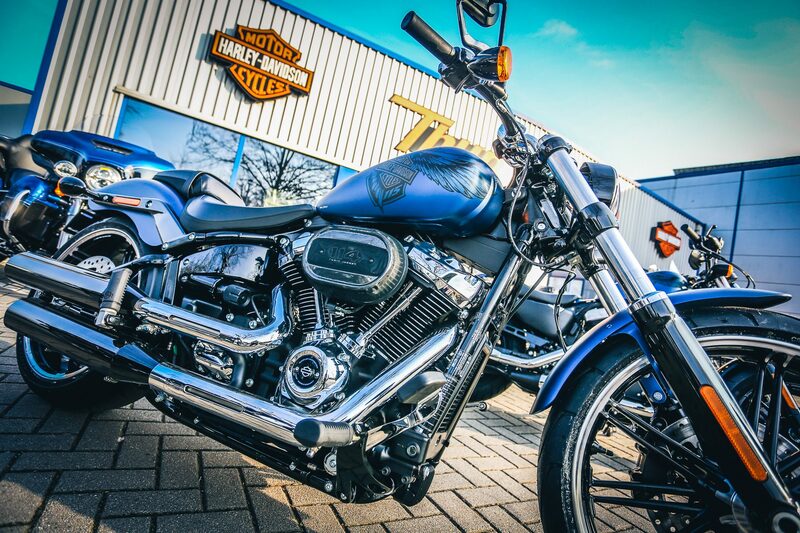 On the occasion of his 115th birthday, Harley-Davidson presents the Fat Boy 114 in this exclusive and strictly limited jubilee version, whose type code is “ANV”. 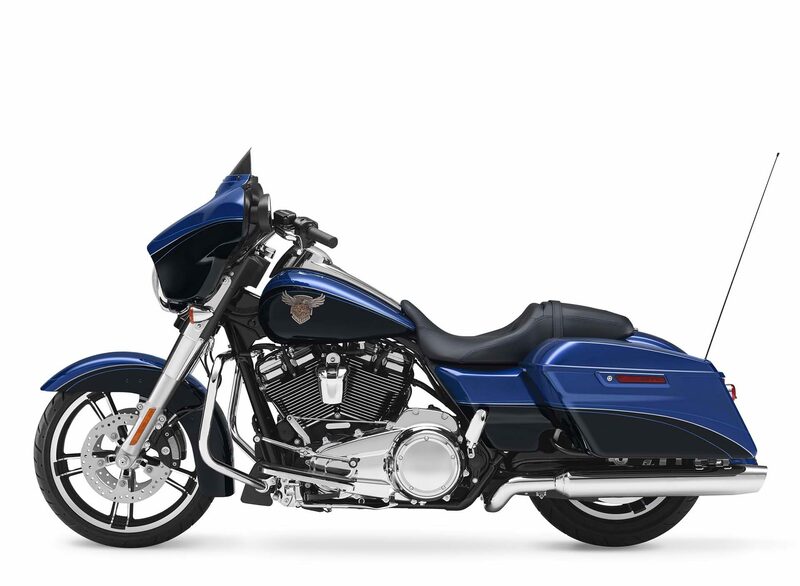 The machine is in the two-color Legend Blue and Vivid Black, which is used exclusively on 115th Anniversary models use. From the front end to the rear, triple Pinstripes extend over the paint. The elaborate, metal-made cloisonné tank medallion features an eagle wearing the Bar and Shield logo in its claws. 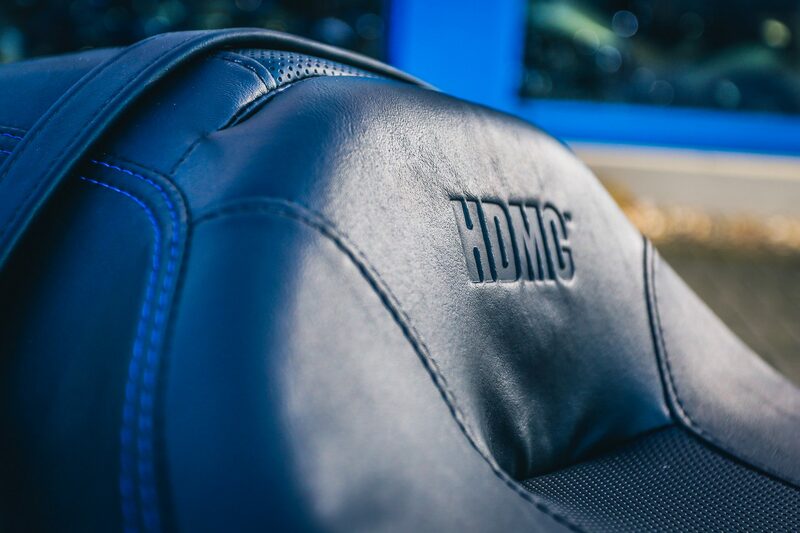 Blue stitching and an embossed “HDMC” lettering adorn the seat, which has a discreetly perforated surface. The serial number was laser engraved into an insert of the tank console. 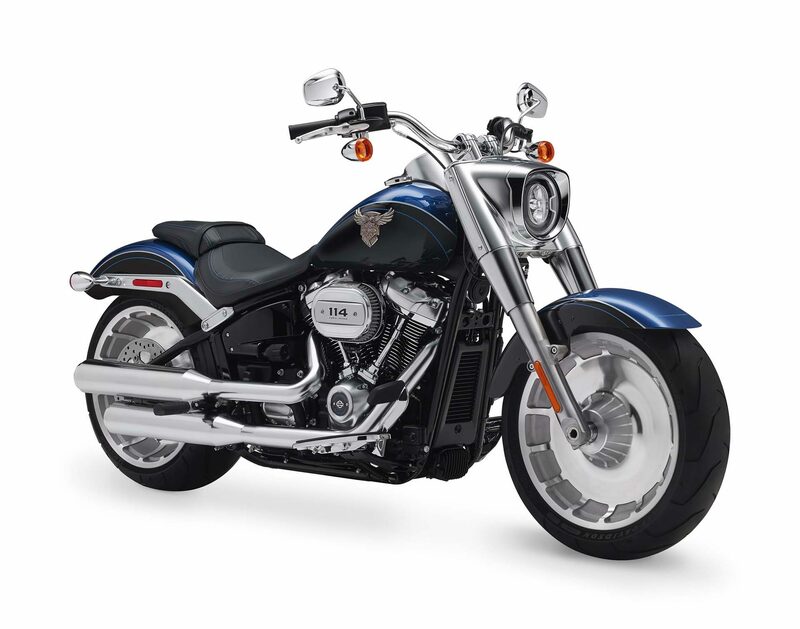 For the impressive performance of the 115th Anniversary Fat Boy 114 provides a 1868 cc, black powder-coated Milwaukee Eight engine. It develops 69 kW (94 hp) at 5020 rpm and a maximum torque of 155 Nm at 3000 rpm, is equipped with a “fan” – air filter and two balance shafts to reduce its vibrations and coupled to the Cruise Drive six-speed gearbox. 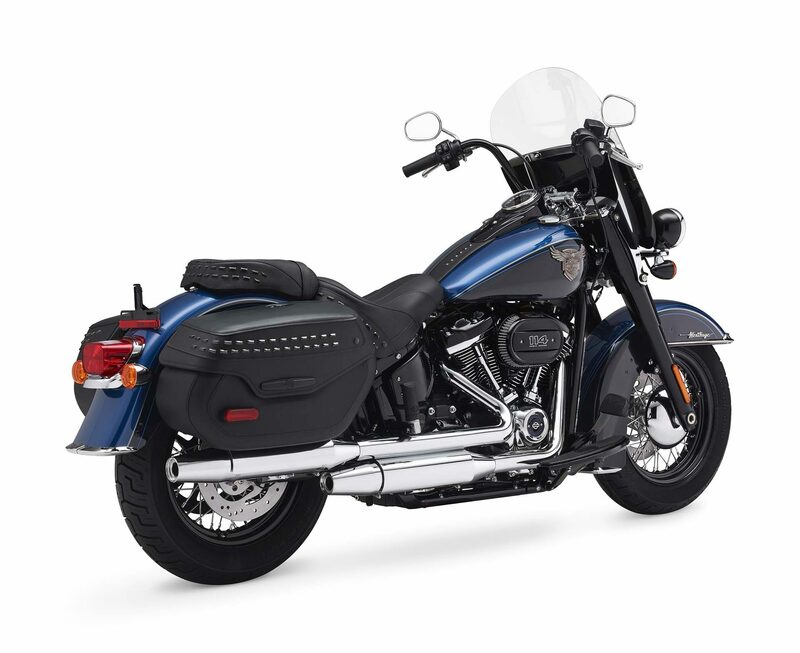 Harley-Davidson rigidly embeds the engine in the redesigned, lighter and extremely stiff Softail chassis for added handiness and comfort. The redesigned swingarm and the new central strut leg hidden under the seat of the observer make the frame look like an unsprung chassis of bygone eras. The spring preload of the strut can be hydraulically adjusted by hand with an externally arranged knob. 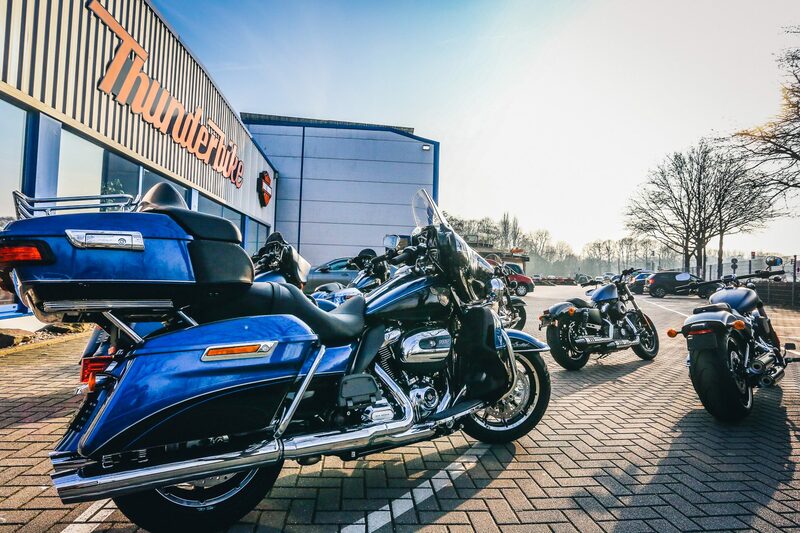 The front wheel guide is also new: a “Dual Bending Valve” telescopic fork with 49 mm standpipe diameter and chrome-plated covers in the style of the Hydra Glide is used. 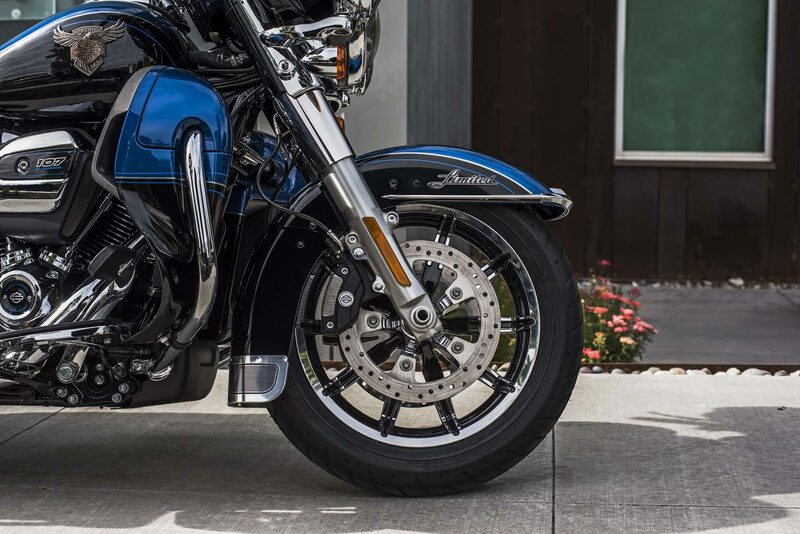 Redesigned, partially polished 18-inch light cast iron wheels in Lakester design rotate at the front and rear. Rear is a wide 240 Michelin used, the front wheel is frosted with a 160. 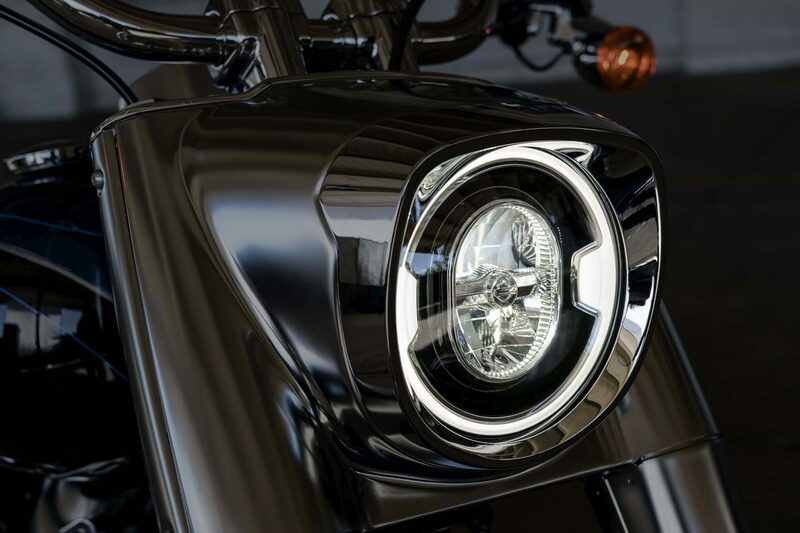 A large, new LED headlamp, which has been integrated into a likewise redesigned housing, crowns the fork, while the taillight function was integrated into the rear turn signals as well as the brake light. 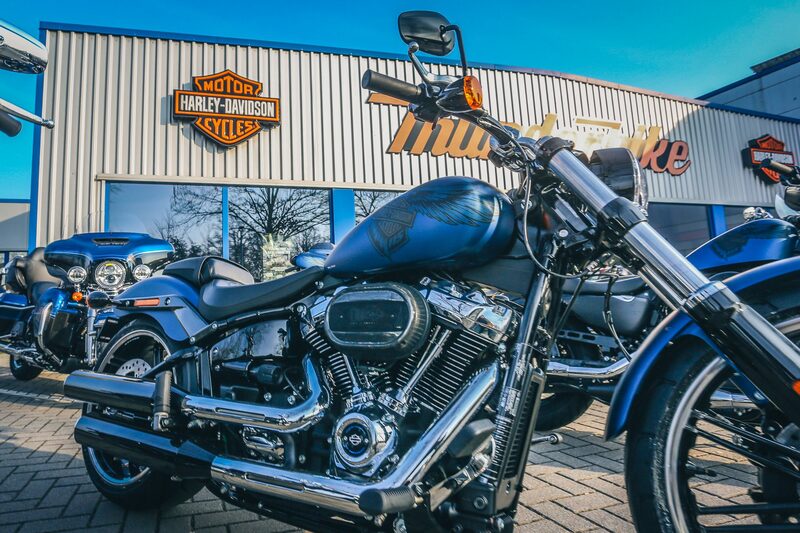 The 115th Anniversary Fat Boy 114 is slowed down by a powerful ABS brake system with one front and rear brake disc and a new, compact rear brake calliper. An ignition key is no longer required thanks to the new Keyless Ignition System. Convenient new features include the USB port for charging mobile devices and the comfortable, redesigned seat. 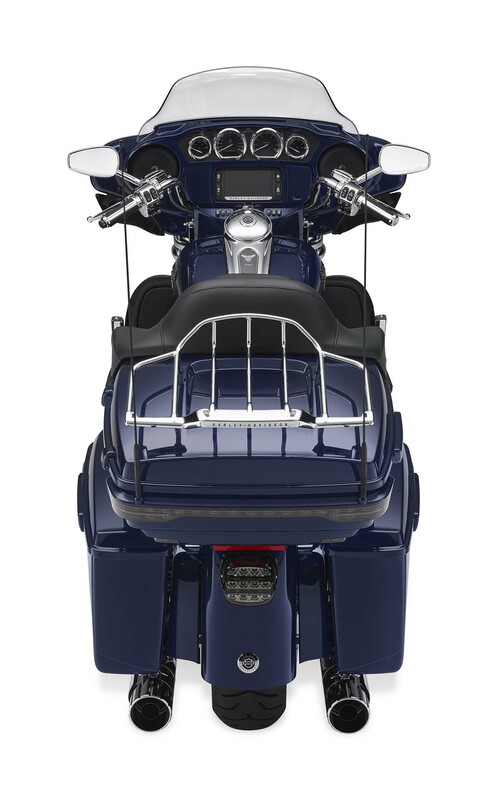 Together with the long running boards and the wide handlebar mounted on a riser, it ensures a very relaxed sitting position. The new speedometer with large information display is housed in a redesigned instrument panel with metal tank strap in the bullet hole look on the 18.9-liter tank. 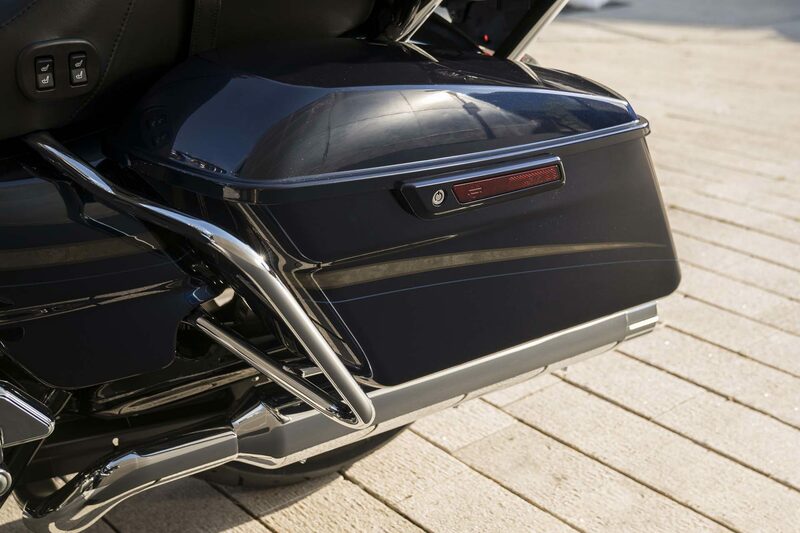 The side covers are finished in classic black while the console, fender holder, fork, headlamp housing and engine covers shine in satin chrome gloss. 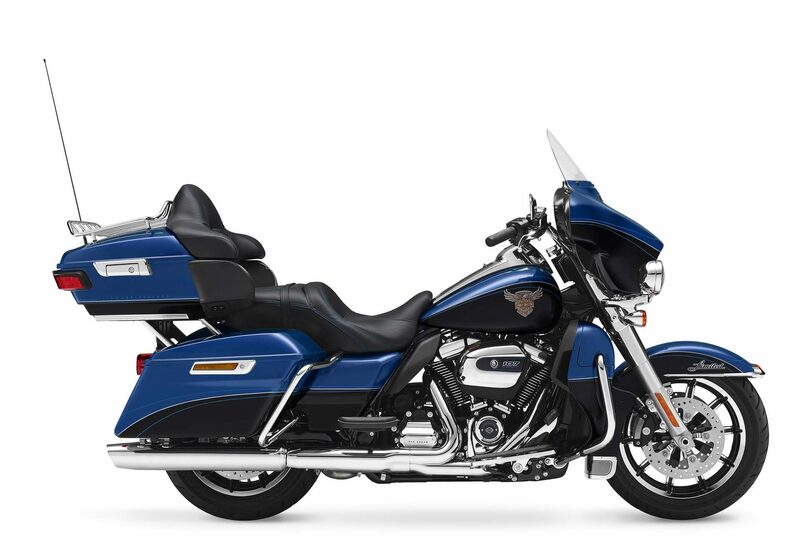 As with any Harley-Davidson comes standard with a security system with self-activating immobilizer and alarm on board. 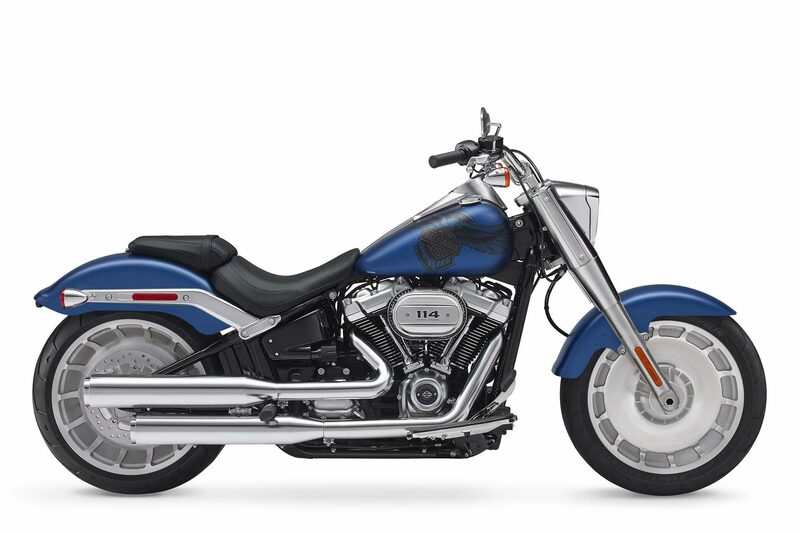 Only 1100 units of the 115th Anniversary Fat Boy 114 in two-tone paint are manufactured in total. 373 of them are destined for markets in Europe, the Middle East and Africa. 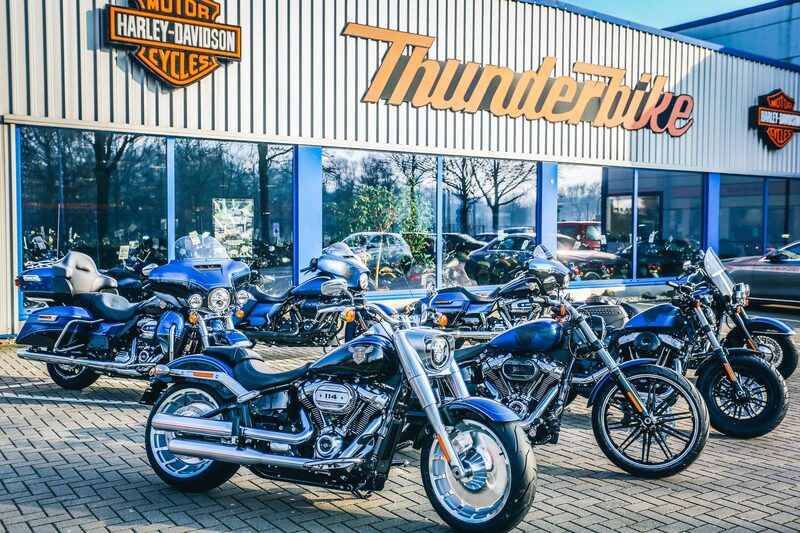 In 2018, Harley-Davidson celebrates its 115th anniversary. 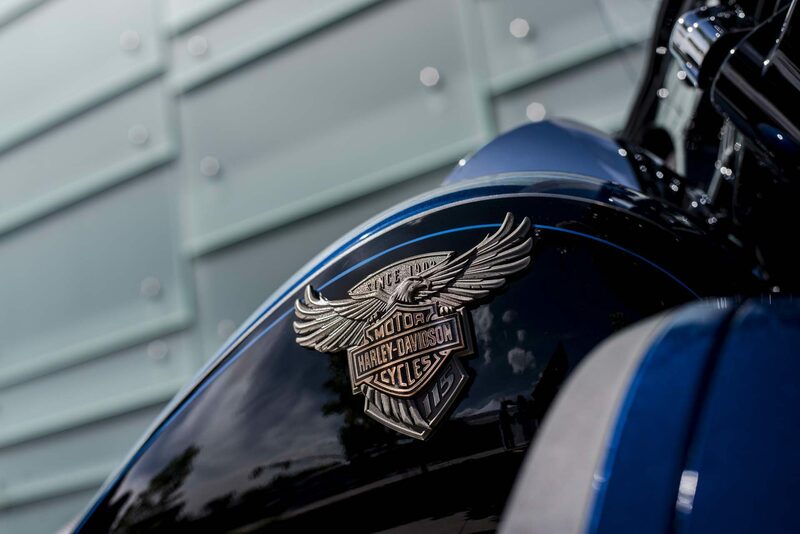 On this occasion, the Motor Company offers the 115th Anniversary Heritage Classic 114 in a strictly limited edition. 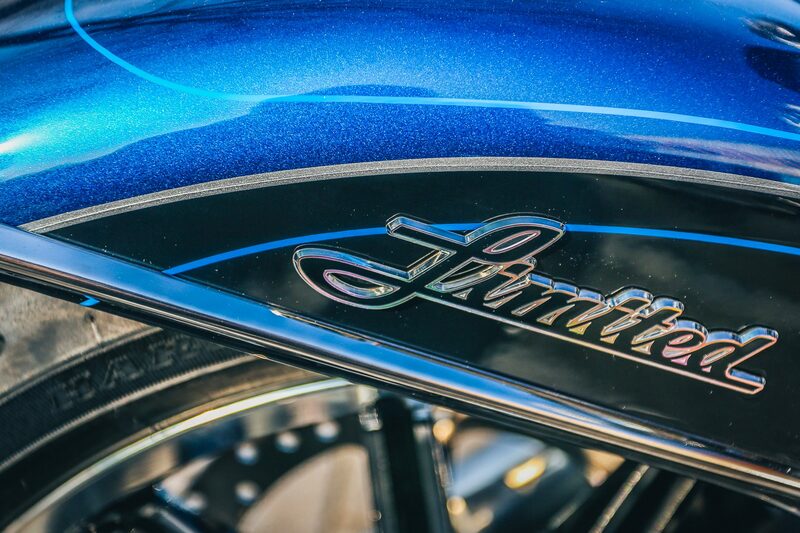 The machine is exclusively made in the color combination Legend Blue & amp; Vivid Black available. Triple Pinstripes extend from the front to the rear. 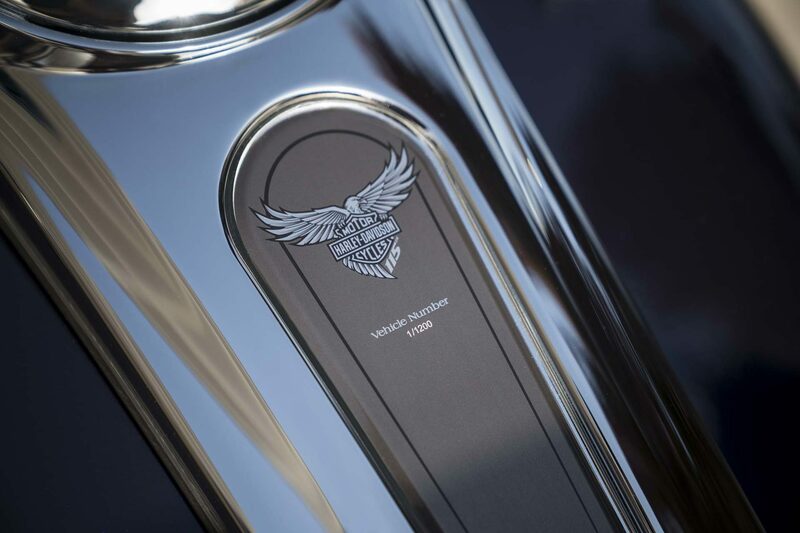 On the sides of the tank emblazoned an elaborate metal cloisonné emblem depicting an eagle holding the Bar and Shield logo. 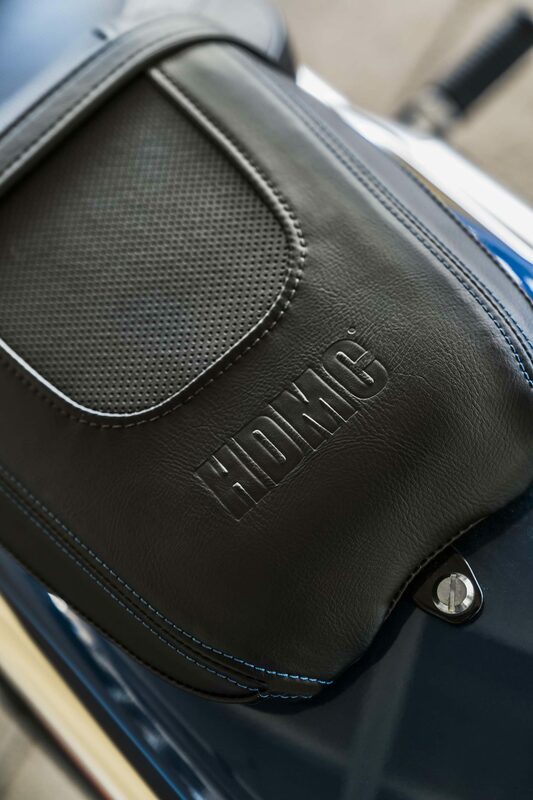 The seat was discreetly perforated and provided with blue stitching and an “HDMC” embossing. On the shiny black coated ignition cover has a blue lettering on the anniversary. 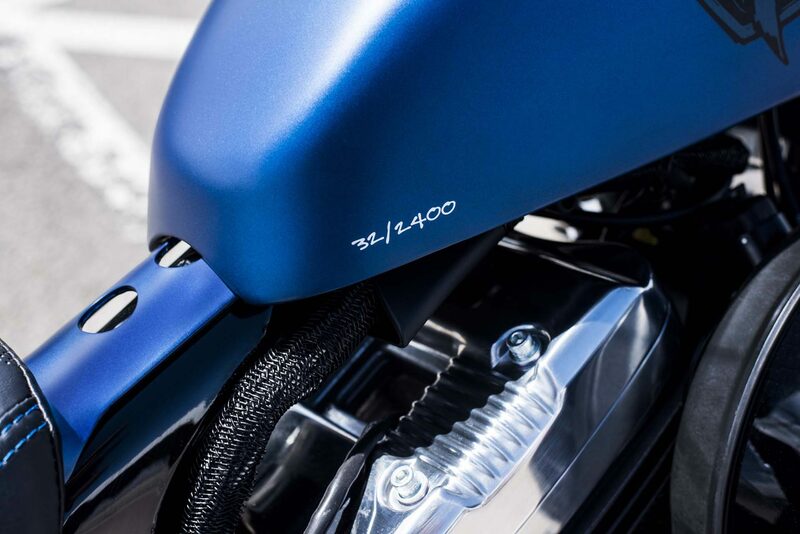 The serial production number can be taken from the sticker on the handlebar clamp. Propulsion is provided by the Milwaukee Eight 114, which is coupled to the Cruise Drive six-speed gearbox, with a displacement of 1868 cm3. It produces 69 kW (94 hp) at 5020 rpm and develops torque of 155 Nm at 3000 rpm. Its vibrations are reduced by two balance shafts so that it can be rigidly connected to the new, much stiffer Softail frame. Its lines are reminiscent of classic rigid frames from bygone eras. To achieve this optical effect, a newly constructed triangular rocker is used, which is connected to a likewise new, located below the seat central strut. The spring preload is hydraulically adjusted. Also new is the “Dual Bending Valve” telescopic fork with 49 mm standpipe diameter. The 115th Anniversary Heritage Classic 114 has been fitted with wide 16-inch tires on fine wire-spoke wheels with black-coated wheels. More manoeuvrable and agile than a 2017 Heritage, it weighs around 17kg less and its incline has increased by three degrees. For the delay is responsible for a brake system with two disc brakes and ABS. New is the rear brake calliper, which now has a more compact design and ensures optimized heat dissipation. 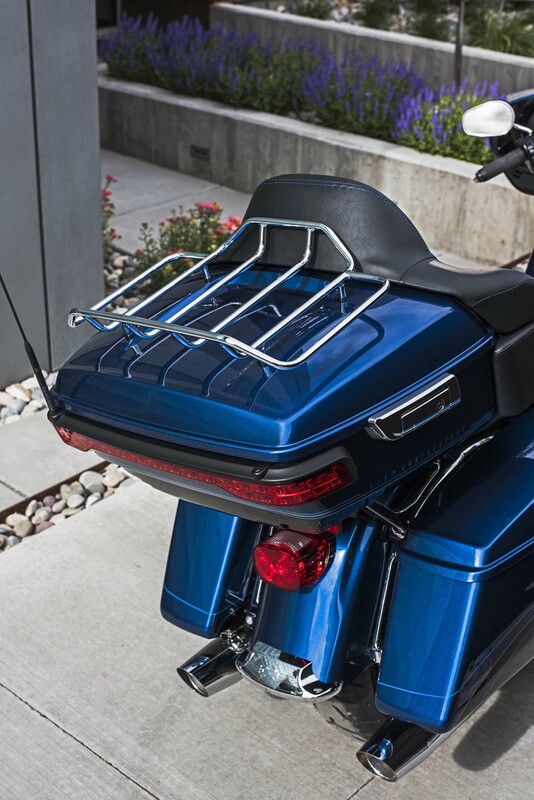 The redesigned seat with leather-covered panels, the ergonomically designed riser-mounted handlebar and the large running boards ensure a high degree of long-distance riding. The new, lockable and waterproof suitcases in the style of saddlebags, whose flanks are covered with leather and decorated with black studs, also contribute to this. 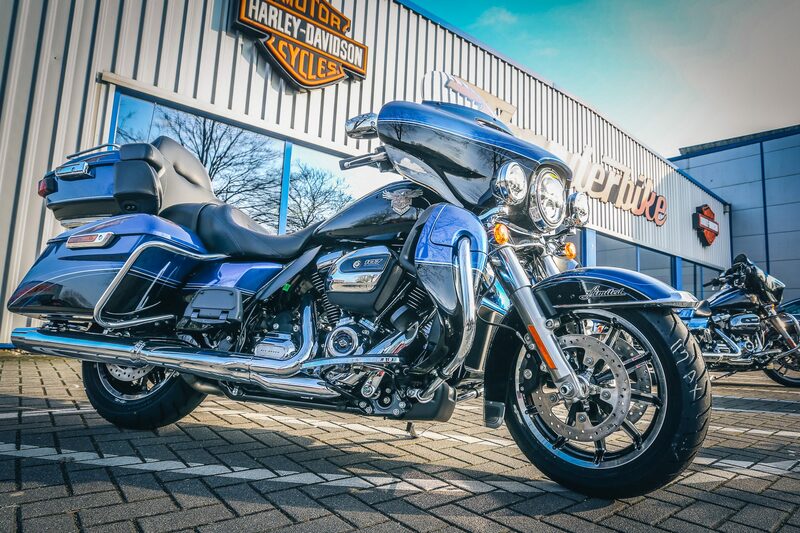 The travel quality is also served by the large windshield, which Harley-Davidson 2018 – in line with the entire front end – dipped in black at the bottom. 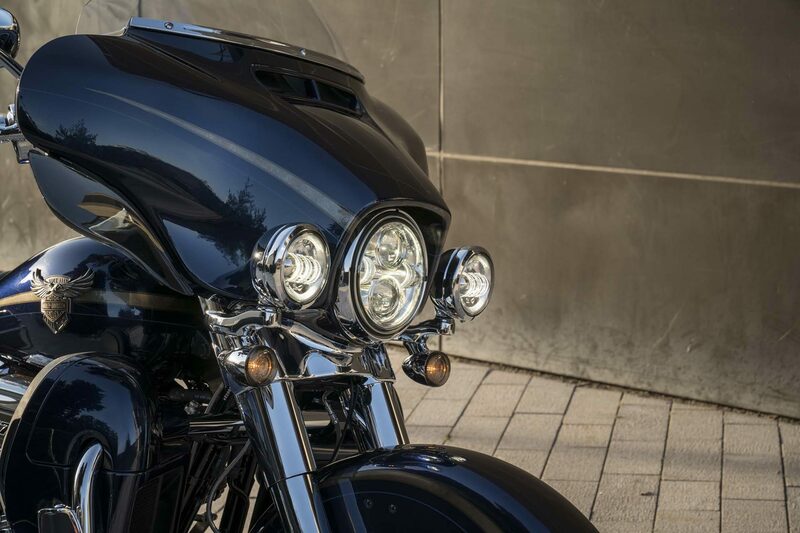 Finally, the fork including its standpipe cover, the handlebar, the turn signals and the three headlights, which now use LED technology, wear black. 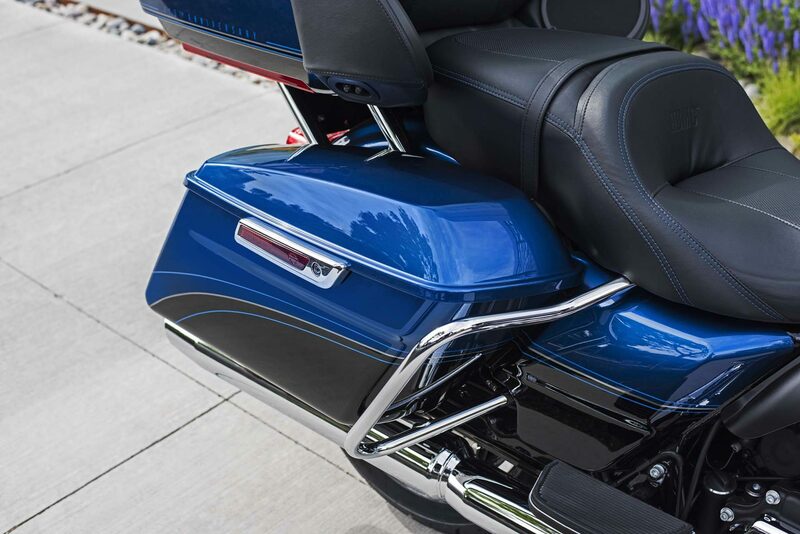 Anyone who appreciates the Boulevard Cruiser look as a solo rider simply disassembles the windshield and pillion seat with just a few simple steps. 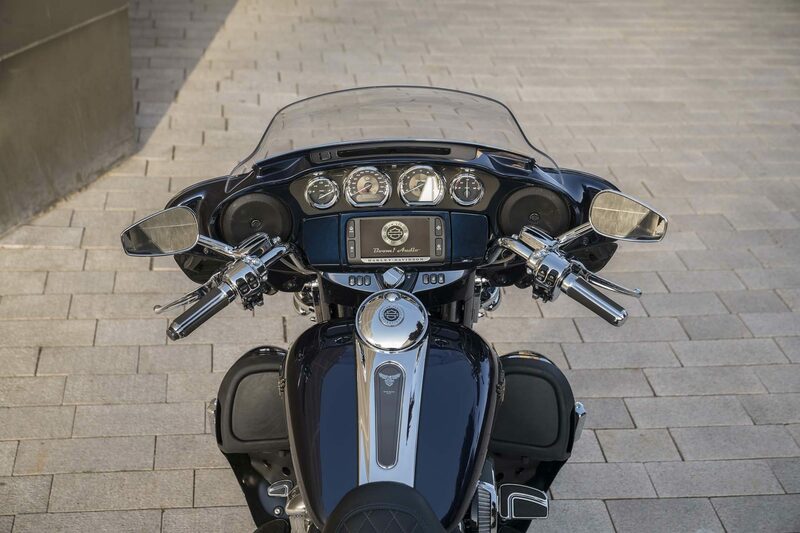 On the 18.9 liter fuel tank, Harley-Davidson mounted a redesigned, black retro console for the new speedometer. Thanks to the new Keyless Ignition System, the driver no longer needs an ignition key. Cruise Control and a security system with immobilizer and alarm system are standard equipment. In addition, mobile devices can now be charged to a new USB port. 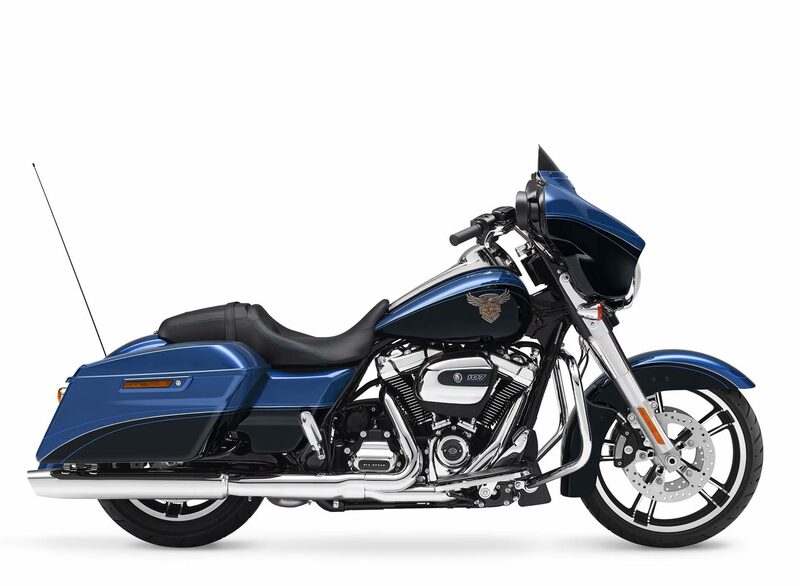 The production of this anniversary model is limited to 1500 units. 301 of these will be available in the markets of Europe, the Middle East and Africa. 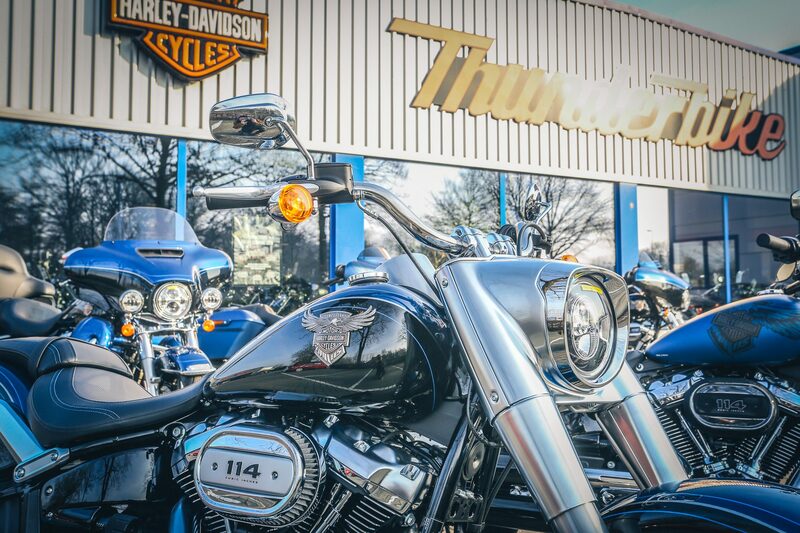 In 2018, Harley-Davidson celebrates its 115th anniversary. 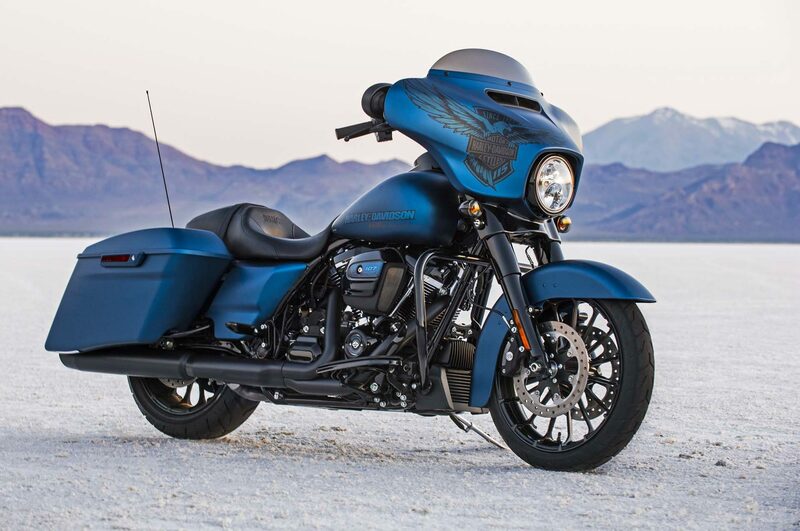 On this occasion, the 115th Anniversary Street Glide was launched. 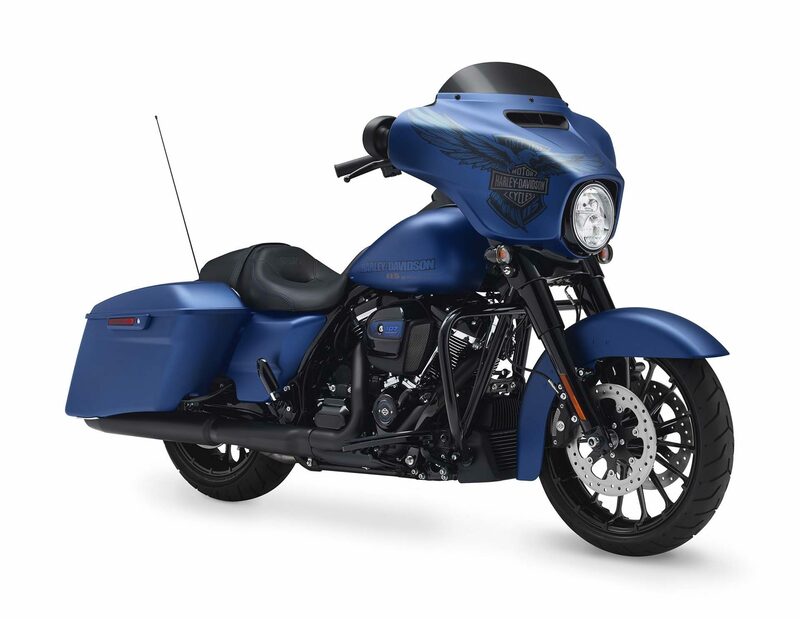 The Limited Edition Street Glide Edition comes in the exclusive Anniversary color legend Legend Blue, combined with the classic black Harley color Vivid Black and triple Pinstripes. The flanks of the tank are adorned with an artfully crafted metal cloisonne tank medallion featuring an eagle with a Bar and Shield logo. 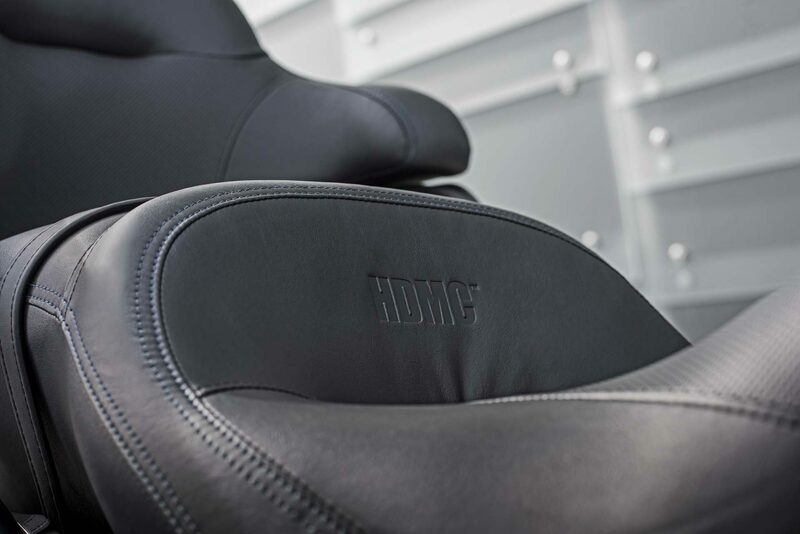 The interior lining is in glossy black and the seat has been discreetly perforated and embossed with “HDMC” lettering. The lettering on the shiny black coated ignition cover and the air filter in blue mark the anniversary. 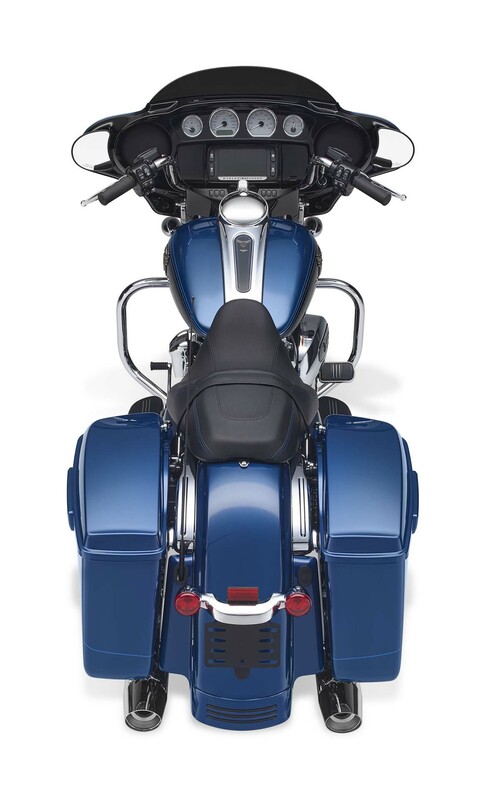 An insert on the tank console can be taken from the serial number of the respective bike. 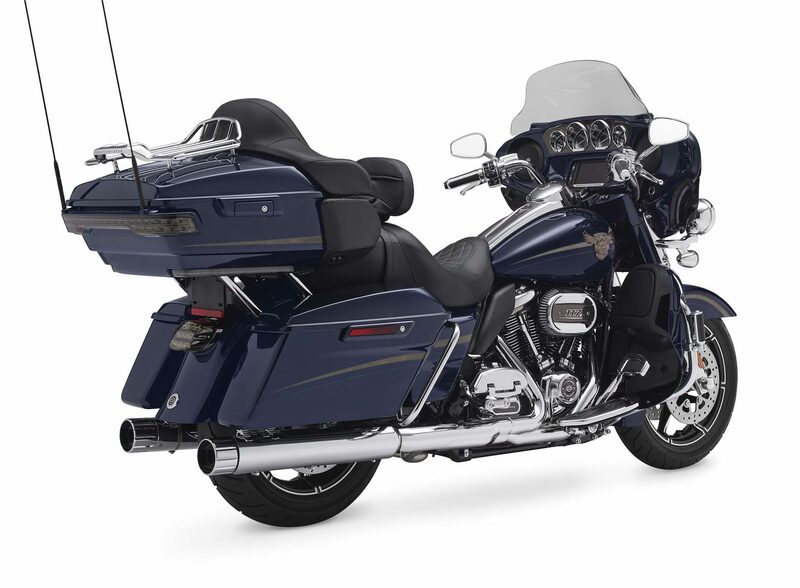 The 115th Anniversary Street Glide is powered by an air-cooled Milwaukee Eight engine with 1745 cc and oil-cooled exhaust valves. It delivers 66 kW (90 hp) at 5450 rpm and its maximum torque is 150 Nm at 3250 rpm. The electronic speed control system Cruise Control is standard equipment. 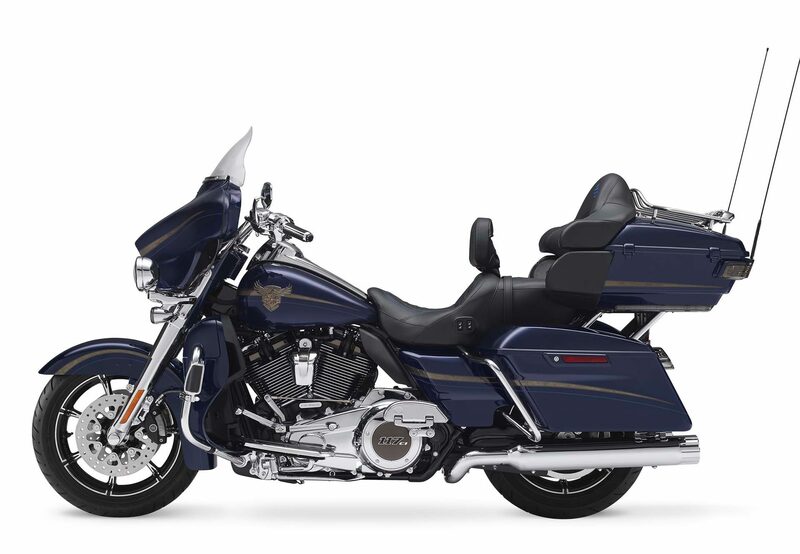 Harley-Davidson embeds the engine vibration-insulated in the ride-stable Touring chassis and couples it with a hydraulic clutch to the Cruise Drive six-speed gearbox. 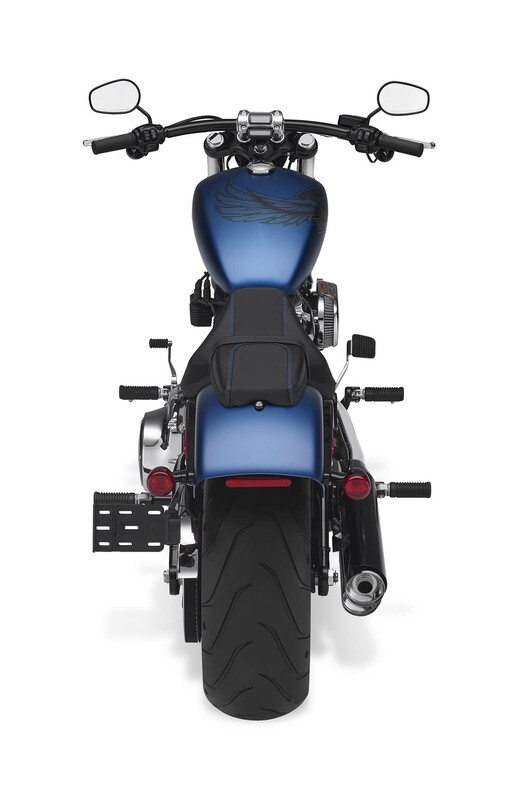 At the front and rear, Enforcer cast metal spoke wheels in “Black and Chrome” look. The swingarm is supported towards the frame with emulsion struts whose spring preload can be adjusted without tools. 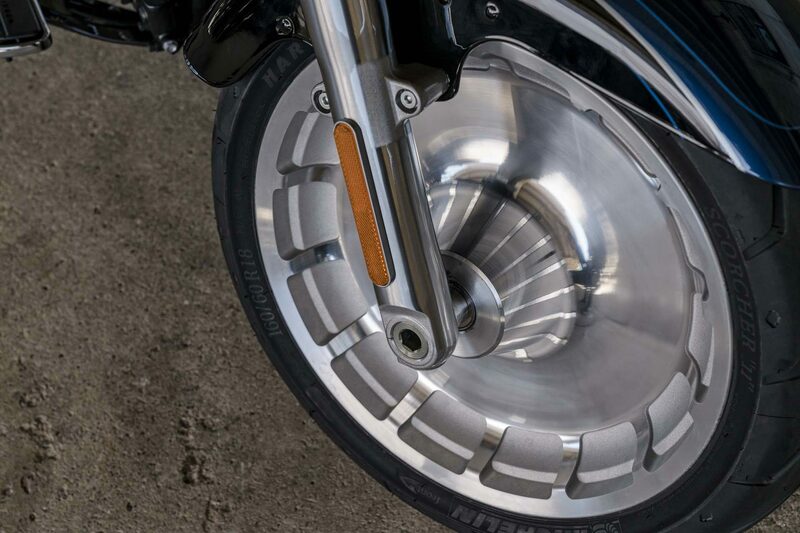 A stiff 49 millimeter “Dual Bending Valve” fork leads the 19-inch front wheel onto which a 130-millimeter-wide tire is mounted, while the 16-inch rear wheel is frosted with a 180er. The deceleration is provided by an ABS brake system with three floating discs and the electronic “reflex” braking force distribution, which regulates the braking forces acting on the front and rear wheels at a speed of approx. 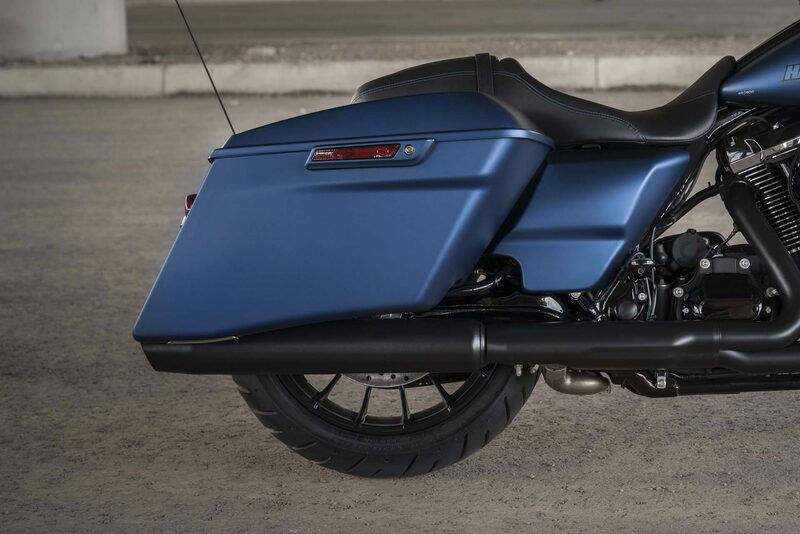 40 km / h.
The 115th Anniversary Street Glide owes its flat silhouette not least to the low-lying chassis and the mini wind deflector to the classic handlebar-mounted “Batwing” fairing. This has a particularly bright halogen headlamp and the split-stream air duct, which prevents turbulence in the head area of ​​the driver. 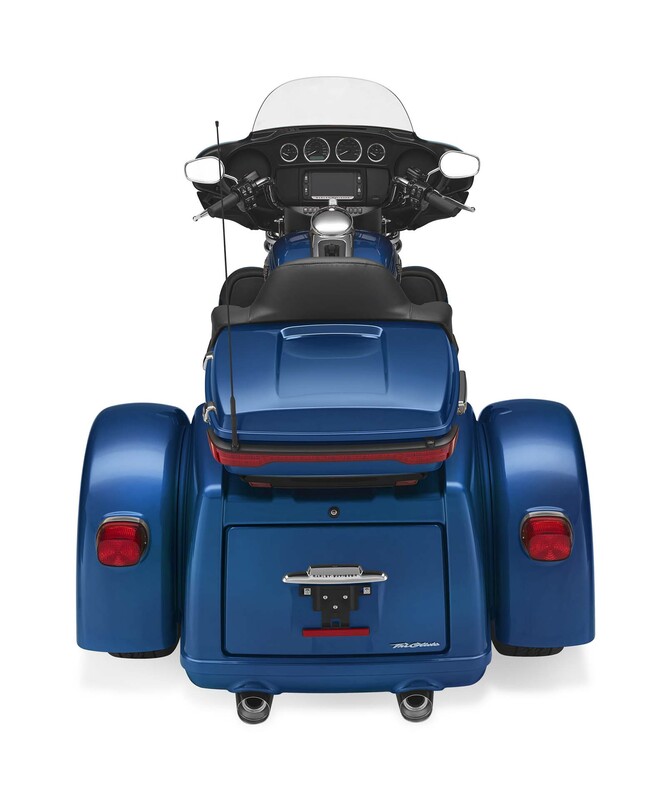 Discreet custom features include the rear and brake lights integrated in the rear turn signals, the elongated, chrome-plated tank console with one-touch fuel filler flap, as well as treadboards, brake pedal and pylon footrests in the Streamliner design. The standard equipment includes large hard case, which can be opened and closed with one hand, and the boom! Box 6.5 GT infotainment system with color touch screen, navigation system, voice control, Bluetooth connectivity, a jukebox compartment with USB port for mobile music players and a power of 2 x 25 watts. In addition, the security system with immobilizer and alarm system is on board. Only 1800 units of this exceptional model will be manufactured, 411 of which will be available in the markets of Europe, Middle East and Africa. 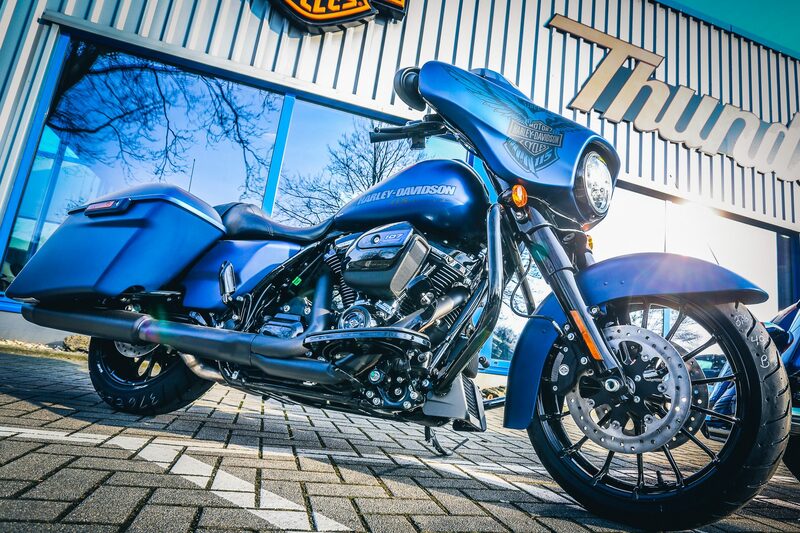 On the occasion of the 115th anniversary of Harley-Davidson, this limited-edition special edition of the Street Glide Special was launched. 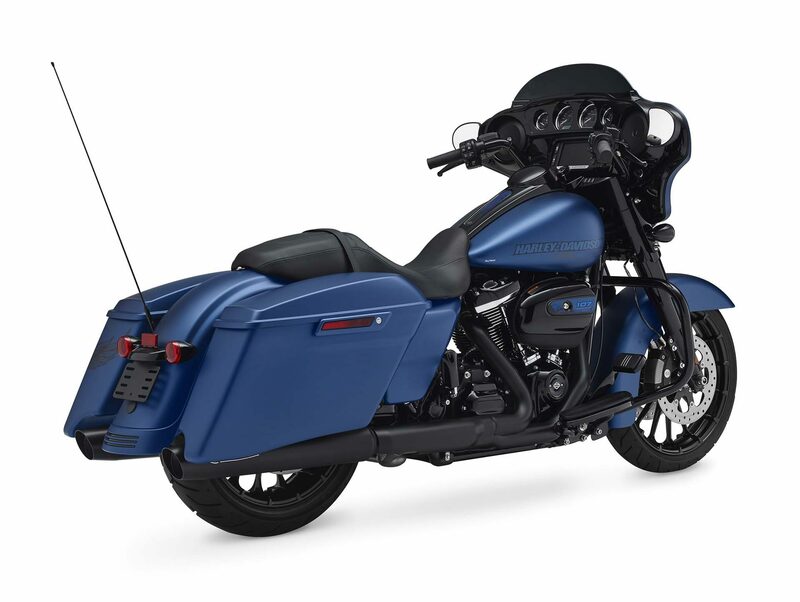 It has all the features that are already featured in the Street Glide Special, as well as the Anniversary insignia, including the paint in the exclusive Legend Blue Denim matt varnish. 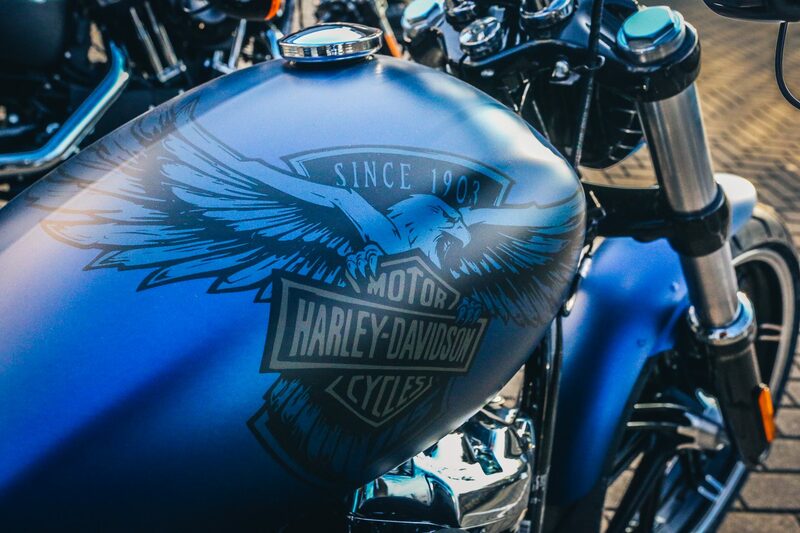 The right side panel and the left case present an asymmetrically tattoo-style eagle with Bar and Shield logo on the tank, the “Harley-Davidson 115 Years” – lettering was applied. 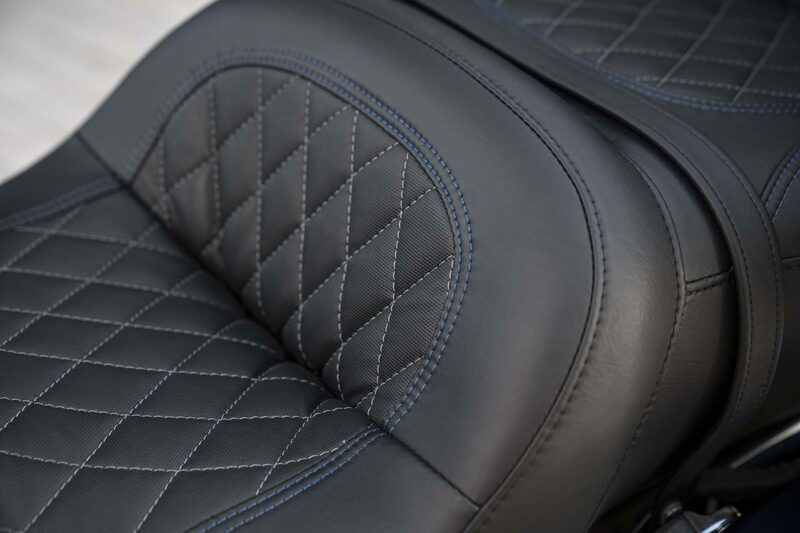 A subtle perforation and blue stitching decorate the seat. 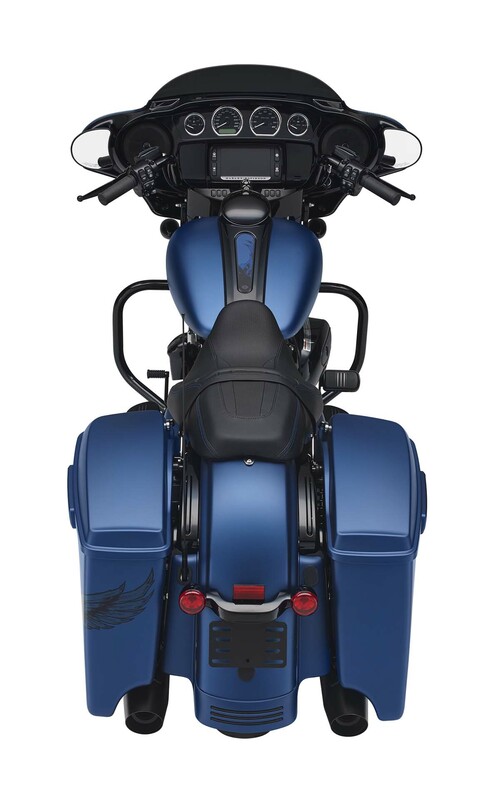 On the shiny black ignition cover and the black-blue air filter housing “115th Anniversary” lettering and the tank console adorns a stylized Eagle in Legend Blue Denim. Each machine is provided with a manually applied to the tank production number. A Milwaukee Eight 107, which scoops 66 kW (90 hp) out of 1745 cc at 5450 rpm and a maximum torque of 150 Nm at 3250 rpm, provides propulsion. 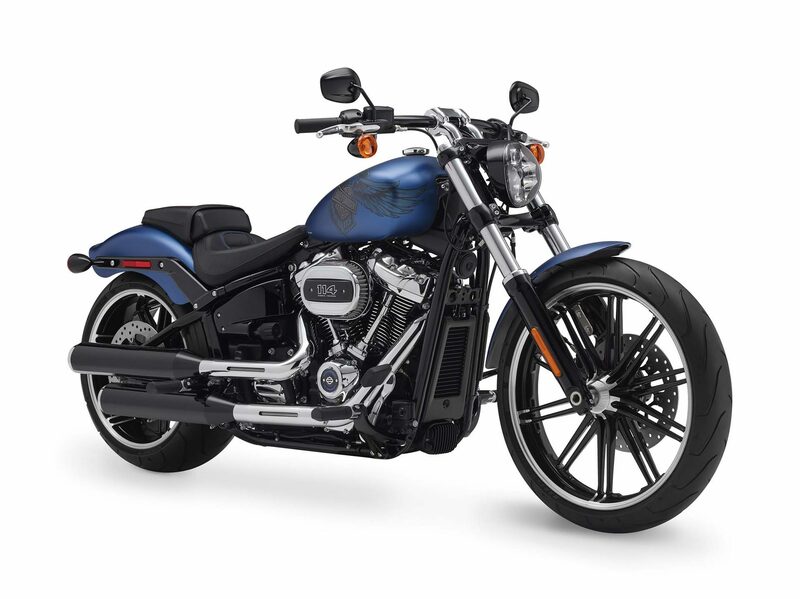 Harley-Davidson combines it vibration-insulated with the Touring chassis, which is equipped with emulsion struts and a 49 mm “Dual Bending Valve” fork. 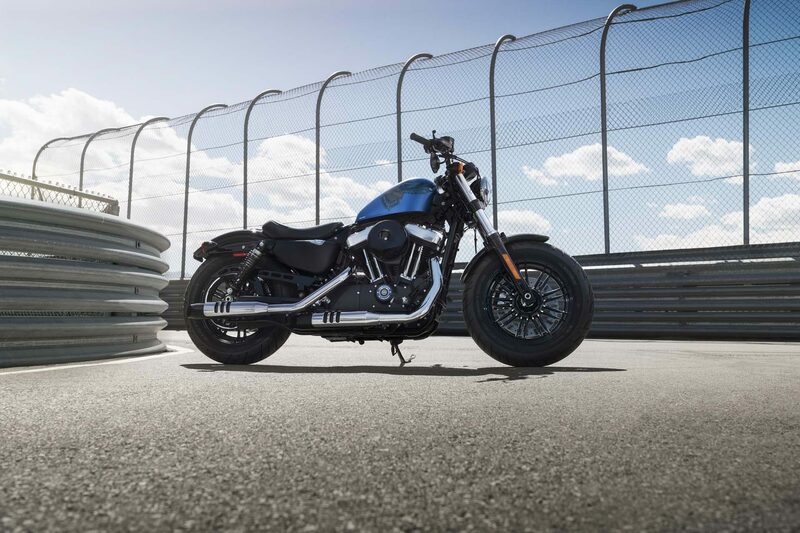 Via a hydraulic clutch, a six-speed gearbox and a toothed belt, the power is transmitted to the rear tire. The cruise control electronic cruise control system is standard. An ABS braking system with electronic braking force distribution is responsible for the deceleration, which regulates the braking forces acting on the front and rear wheels at speeds of around 40 km / h and over. Front is a 19-inch wheel used, at the rear rotates an 18-inch model. To accentuate the elegant lines of the machine, the spacious hard-shell cases were stretched towards the exhaust in the rear area. For a particularly relaxed sitting position, the triangle is made of mini Ape handlebar, touring seat and running boards. 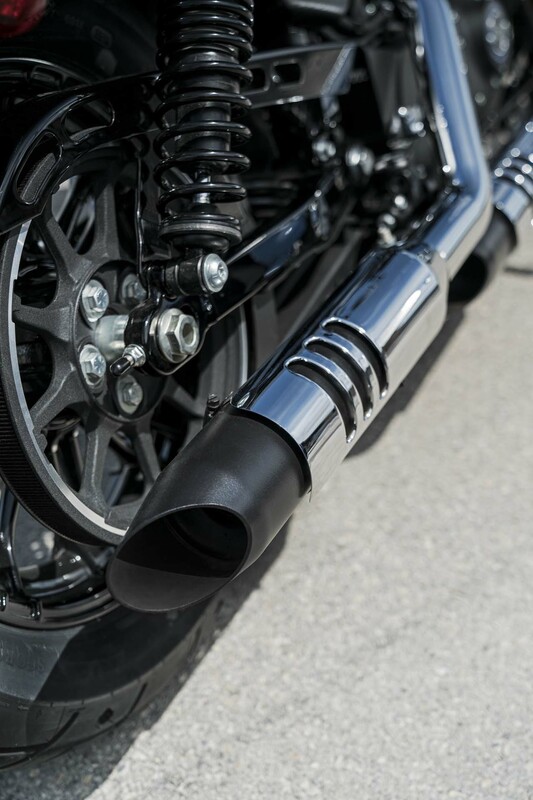 The wheels, the engine, the exhaust system, the fork and the interior lining are among the many components that have been dipped in deep black. 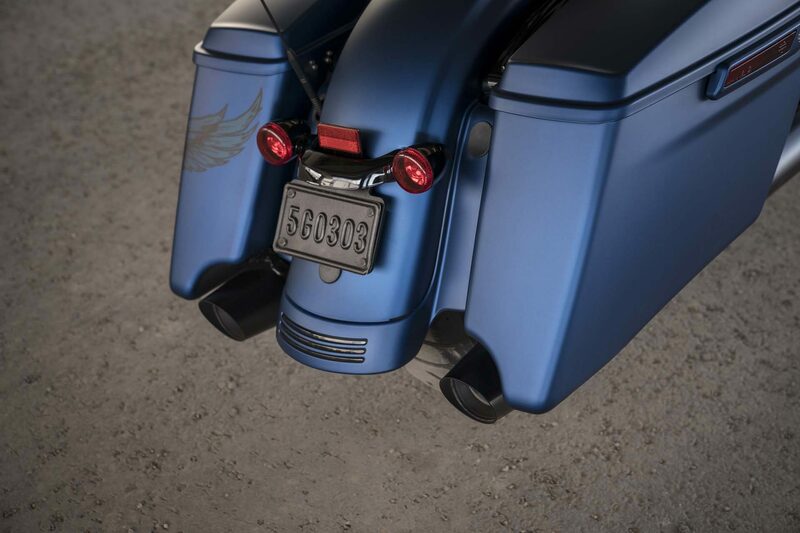 Discreet custom features include the turn signal and brake lights integrated into the turn signals, the elongated tank console, as well as running boards, brake pedal and pylon footrests in the Streamliner design. 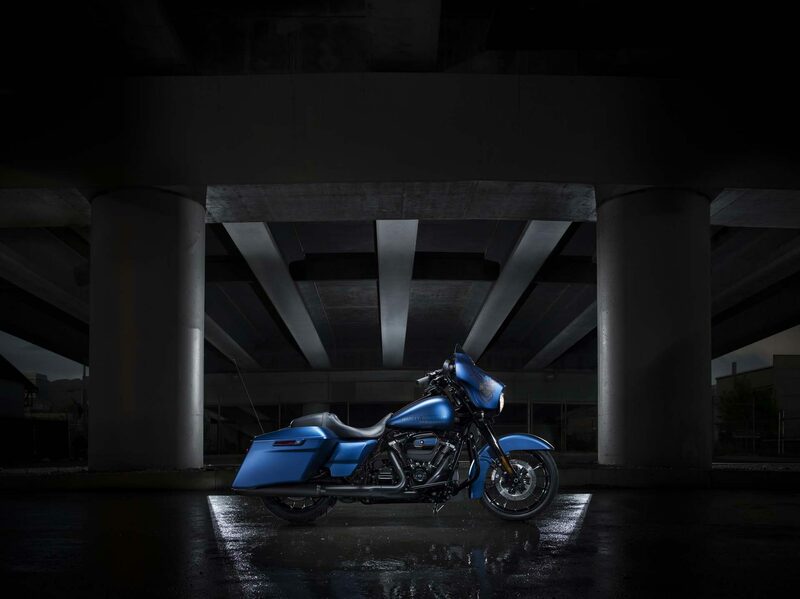 The slim, slim silhouette of the 115th Anniversary Street Glide Special is due to the low-profile suspension and short, tinted glass on the “Batwing”, featuring a high-intensity halogen headlamp and split-stream air duct that eliminates turbulence in the driver’s head. A boom! Box 6.5 GT infotainment system provides entertainment. It features a color touch screen, navigation system, voice control, Bluetooth connectivity and a jukebox compartment with USB port for mobile music players and two sonorous 6.5-inch speakers. The security system with alarm system and immobilizer is standard equipment. 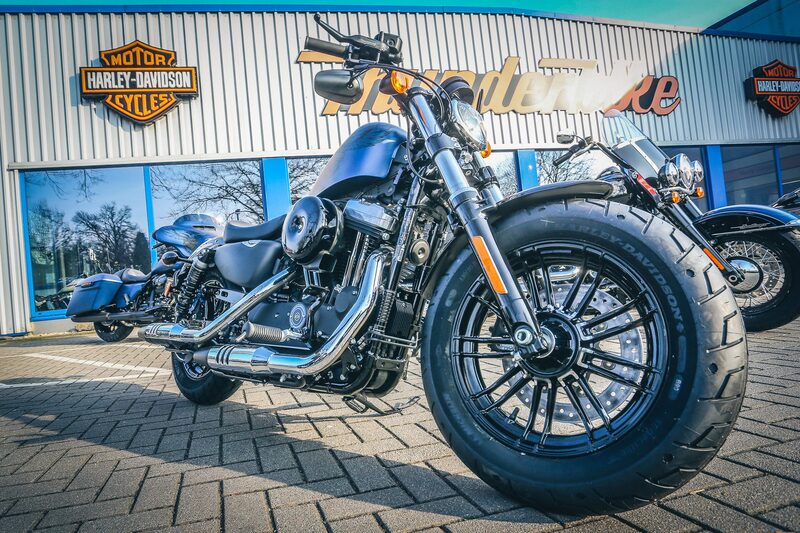 Harley-Davidson manufactures 1900 units of this exclusive model, 305 of which are designed for markets in Europe, the Middle East and Africa. 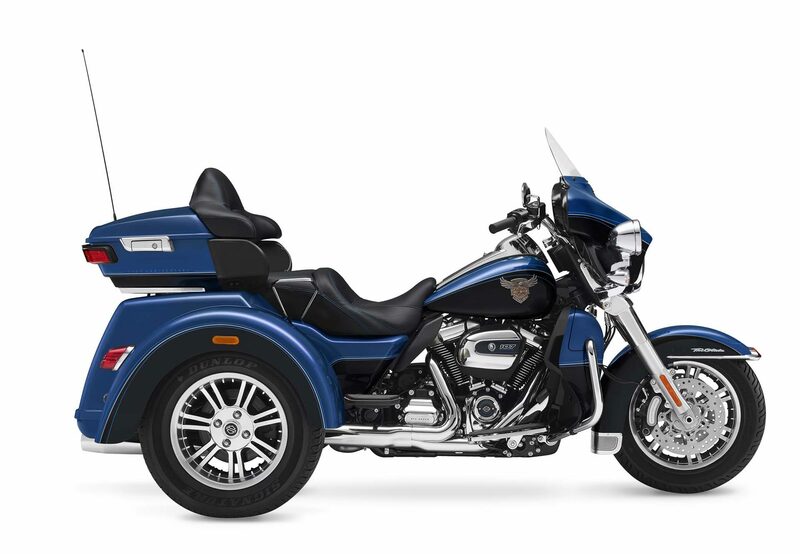 Contrary to many other trikes, the Tri Glide Ultra was designed as a three-wheeled vehicle right from the start and is therefore characterized by particularly well-balanced handling. 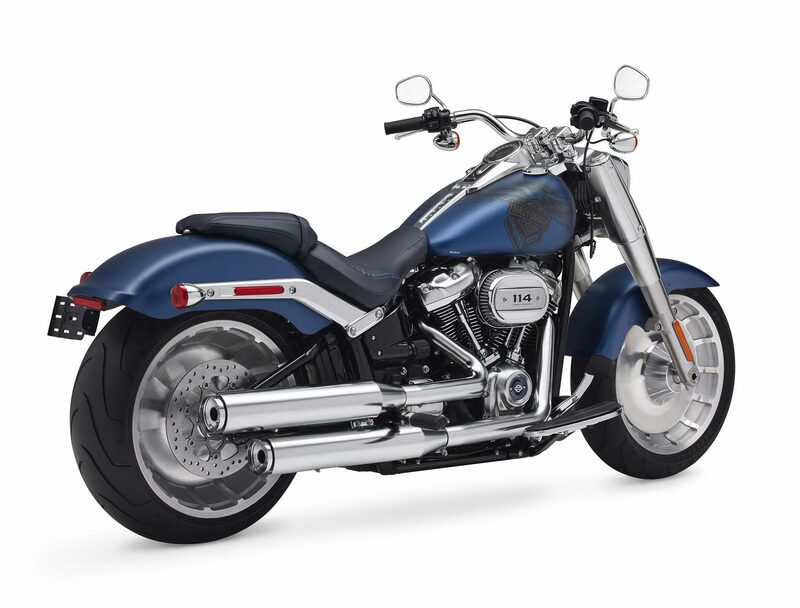 In model year 2018, it is also available in an exclusive 115th Anniversary version, which is manufactured in strictly limited quantities. 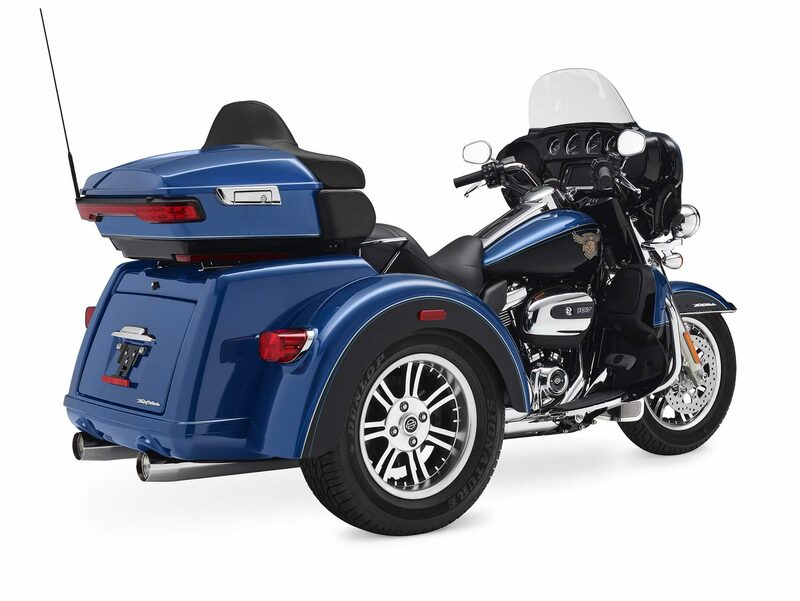 It features all the features of a standard Tri Glide Ultra and features Anniversary insignia, including Legend Blue and Vivid Black livery with triple pinstripes. 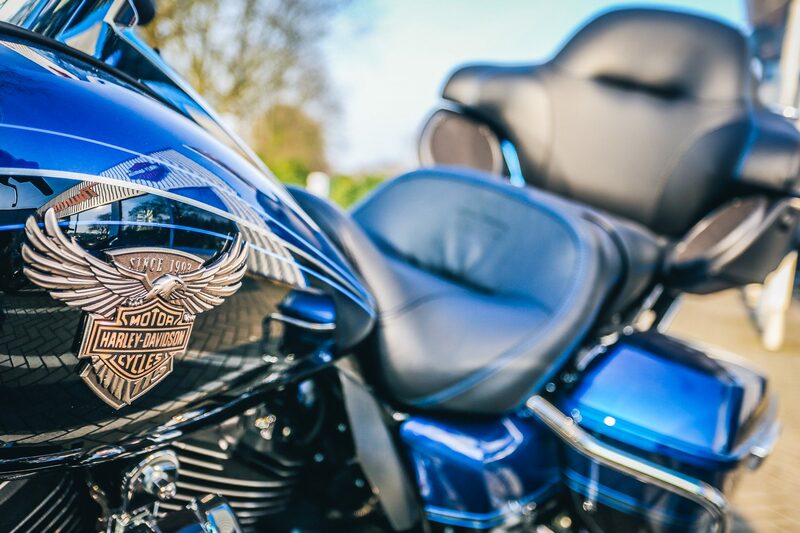 An eagle with Bar and Shield logo – crafted as a metal cloisonné locket – adorns the tank, subtle perforations and blue stitching and an embossed “HDMC” lettering adorn the seat. “115th” – or “115th Anniversary” lettering applied to the air filter housing and glossy black coated ignition cover. The serial number can be found on the insert on the fuel filler flap. 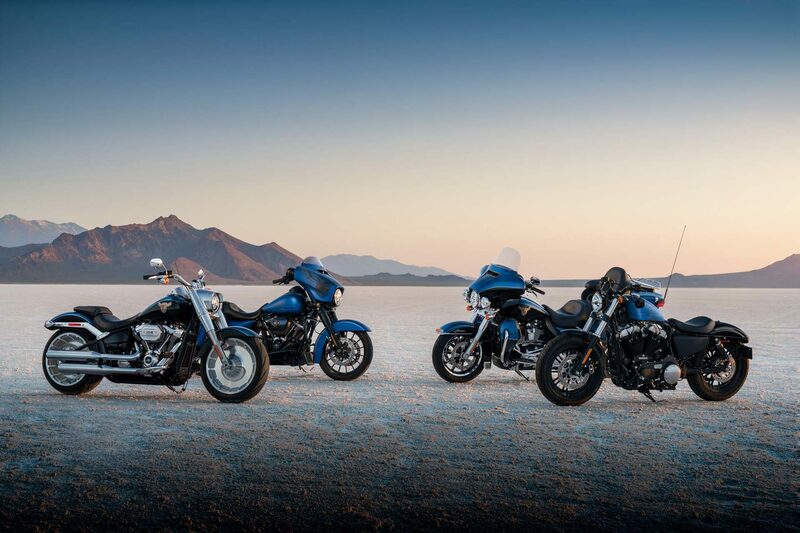 Powered by the Twin Cooled Milwaukee Eight (1745 cc), the exceptional trike delivers 66 kW (90 bhp) at 5450 rpm and a maximum torque of 152 Nm at 3250 rpm. It is connected to the six-speed gearbox via a hydraulically actuated clutch. If required, an electrically operated reversing aid can be activated. 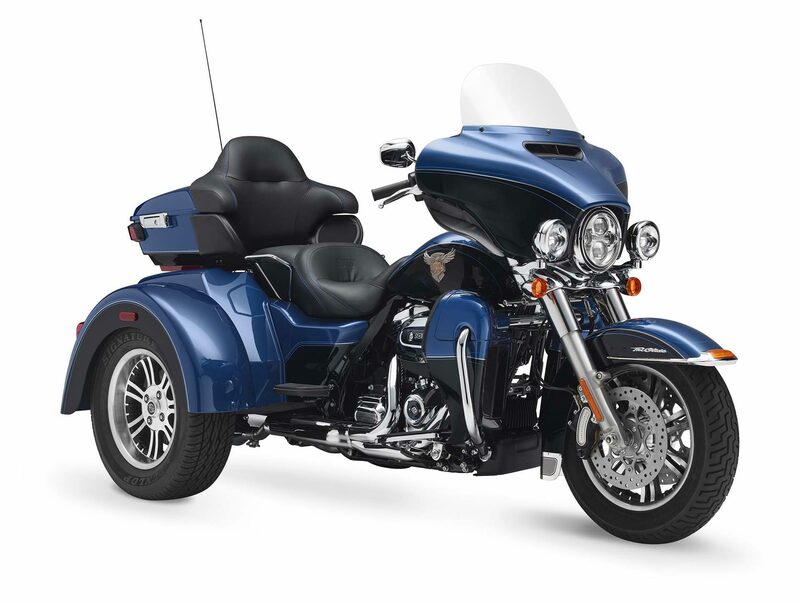 The V-Twin is vibration-decoupled suspended in the Trike chassis, whose fork angle of 32 degrees corresponds to the special requirements of a three-wheeled vehicle. The fork with 49 mm standpipe diameter carries a 16-inch cast spoke wheel. At the rear, two 15-inch cast spoke wheels fitted with 205 tires rotate on a rigid axle with air-assisted struts. Two brake discs each at the front and rear take over the deceleration. In addition there is the parking brake which can be activated by foot pedal. A hydraulically controlled brake force distribution ensures that the front and rear wheels are decelerated simultaneously when the brake pedal is pressed. 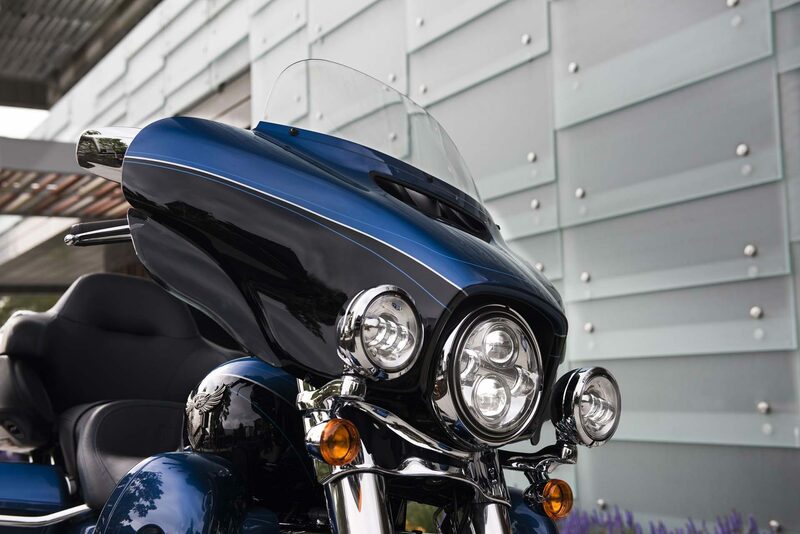 Harley-Davidson integrated a split-stream air channel into the aerodynamically designed “Batwing” jacket to prevent turbulence behind the windscreen. Two high-intensity Daymaker LED headlamps and the additional brake light in the form of the LED light bar integrated in the sliding Tour-Pak (top case) guarantee even more safety. 190 liters of luggage can be found in the large Tour-Pak with one-touch operation and in the spacious trunk. 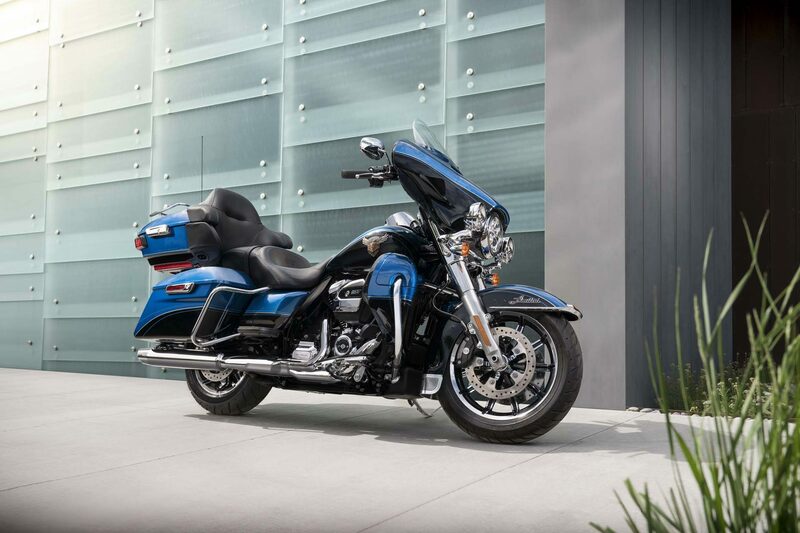 The one-touch fuel filler flap, intuitive handlebar controls and large gauges provide added comfort for the driver. Particularly large and comfortable, the designers designed the passenger seat. The standard also includes an electronic cruise control system and the boom! Box 6.5 GT infotainment system with color touch screen, navigation system, voice control in nine languages, jukebox compartment and bass port in Tour-Pak. Standard on board is the security system with alarm and immobilizer. 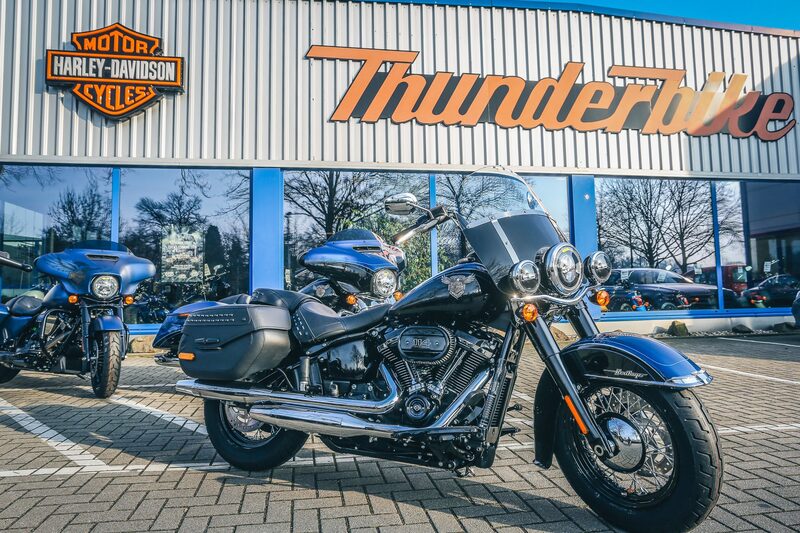 Harley-Davidson makes 1900 units of this exclusive trike, 83 of which are destined for markets in Europe, the Middle East and Africa. 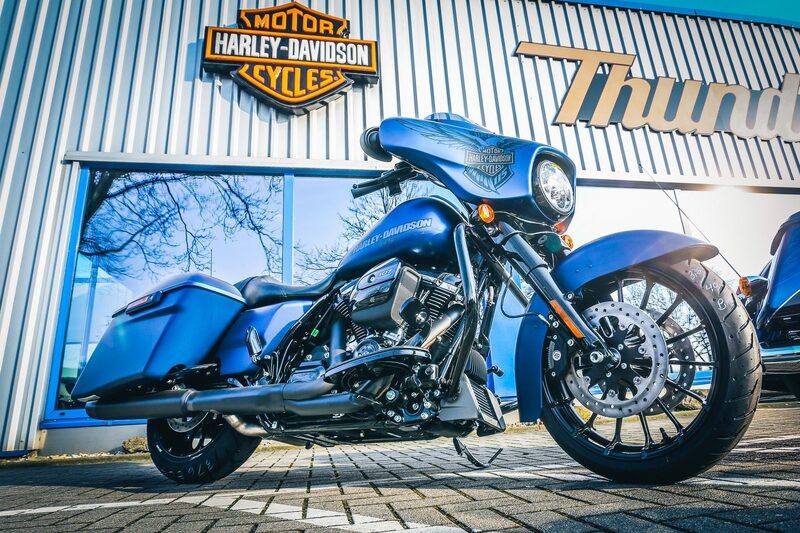 The top model among the standard Harley-Davidson Touring Bikes will also be produced in model year 2018 in this particularly noble and limited edition 115th Anniversary version. 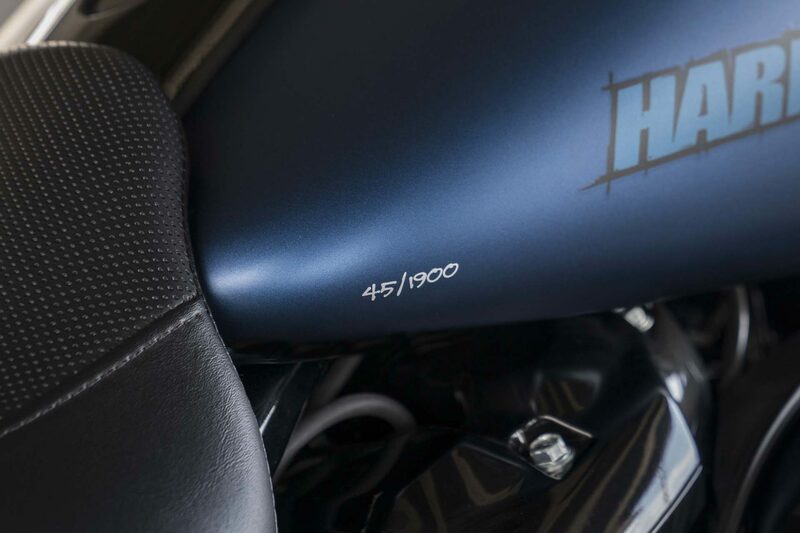 The machine is painted in the exclusive anniversary color Legend Blue, which was combined with classic Vivid Black and triple Pinstripes. The artfully made of metal cloisonné tank medallion shows an eagle with Bar and Shield logo. 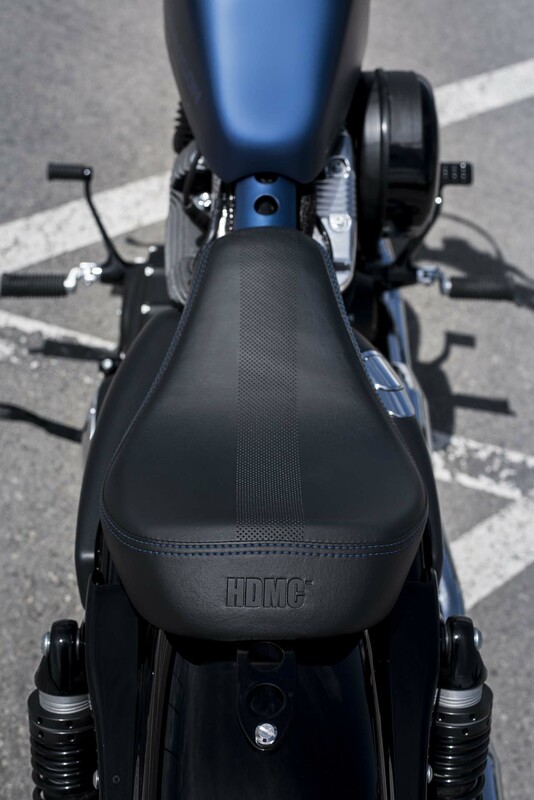 The designers perforated the seat and stitched it with blue stitching and embossed “HDMC” lettering. 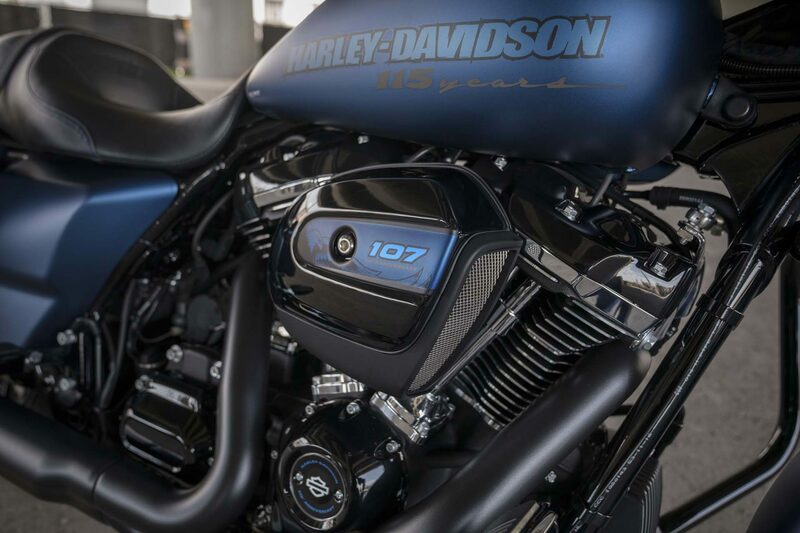 On the air filter housing, the glossy black coated ignition cover and the flank of the Tour-Pak (top case) show “115th” – or “115th Anniversary” lettering. The serial number is recorded on the fuel filler flap. 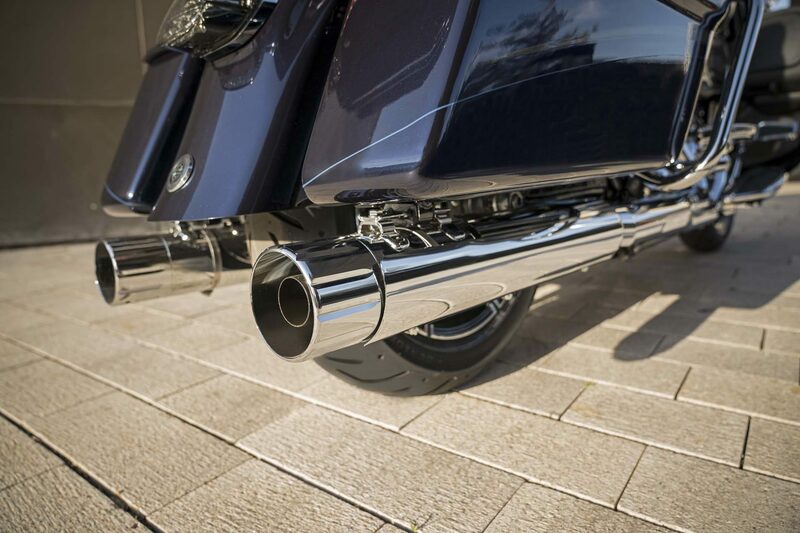 Propulsion is provided by the Twin Cooled Milwaukee Eight 107. The V2 draws out 1745 cc of 67 kW (91 hp) at 5450 rpm and develops a maximum torque of 153 Nm at 3250 rpm. 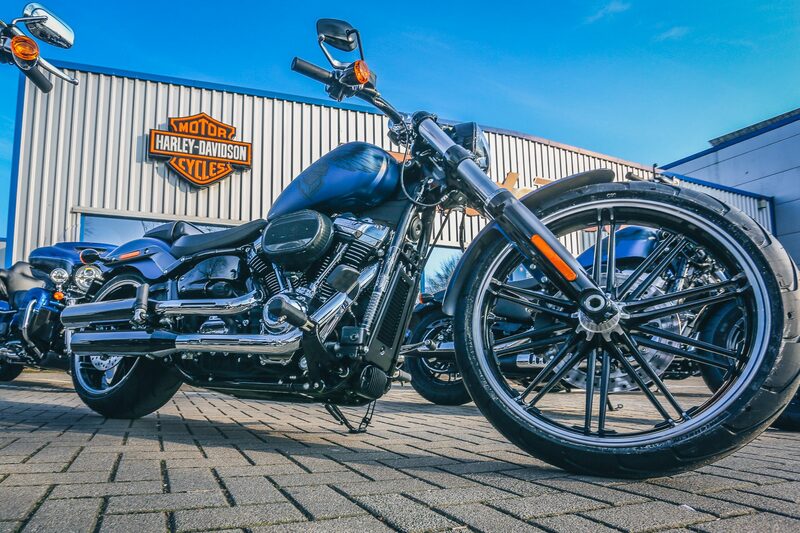 Harley-Davidson connects the engine via a hydraulically actuated clutch to the Cruise Drive six-speed gearbox and stores it in a vibration-resistant manner in the touring-stable Touring frame. Its stiff rocker is equipped with emulsion struts whose spring preload can be adjusted manually with a rotary knob. At the front, a “Dual Bending Valve” fork with 49 mm standpipe diameter ensures maximum comfort and high driving stability. 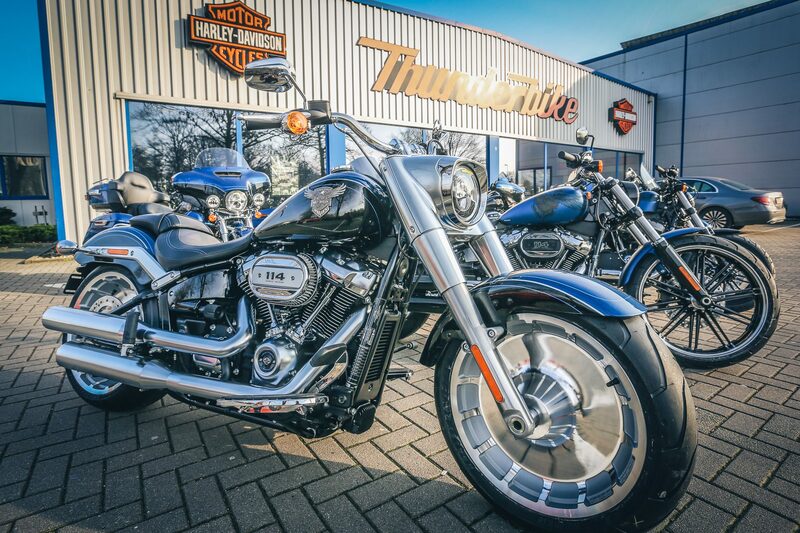 The bike rolls on Contrast Chrome alloy wheels with ten cast-iron spokes, whose deceleration is provided by a braking system with three disc brakes, electronic brake force distribution and ABS. The aerodynamically shaped “Batwing” jacket features a glossy black interior trim and a split-stream air channel that eliminates headlamp turbulence. For good visibility, the powerful Daymaker LED headlights and fog lights guarantee. 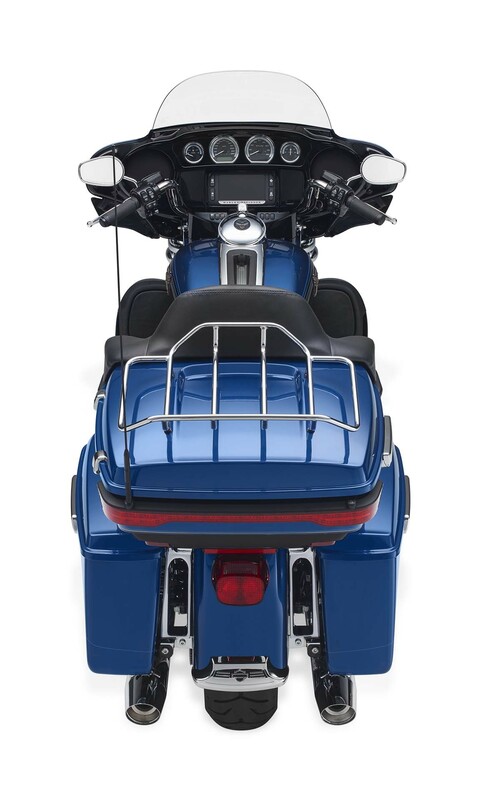 The sliding Tour-Pak (top case) with integrated LED rear and brake light bar and the spacious suitcases score with the same practical “One Touch” operation, with which other features such as the fuel filler flap can be opened. The boom is particularly powerful. Box 6.5 GT infotainment system with color touch screen, navigation system, voice control in nine languages, jukebox compartment and a bass port in Tour-Pak. 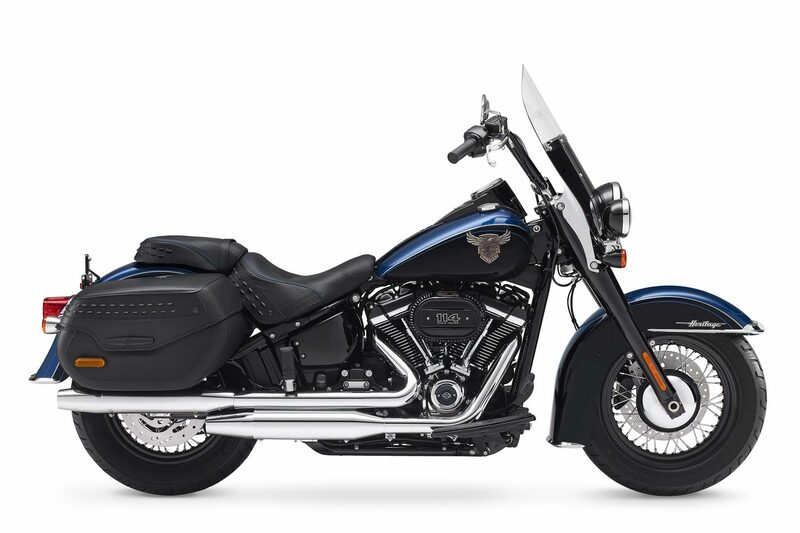 Large Stadium Style gauges and intuitive handlebar controls offer great ease of use, and the passenger finds a very comfortable fit. 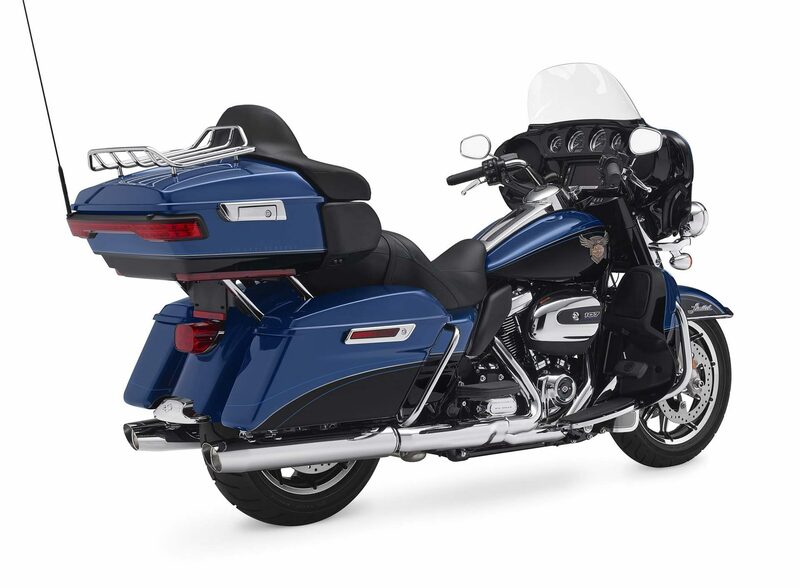 For ultimate comfort, heated handlebar grips, the large, polished premium luggage rack, inner pockets for the lockable hard-case cases, and the Tour-Pak and 12-volt power outlet inside. Of course, this machine also has the security system with immobilizer and alarm, which automatically activate and deactivate. Only 3700 units of this model are manufactured, 501 of which are destined for markets in Europe, the Middle East and Africa. 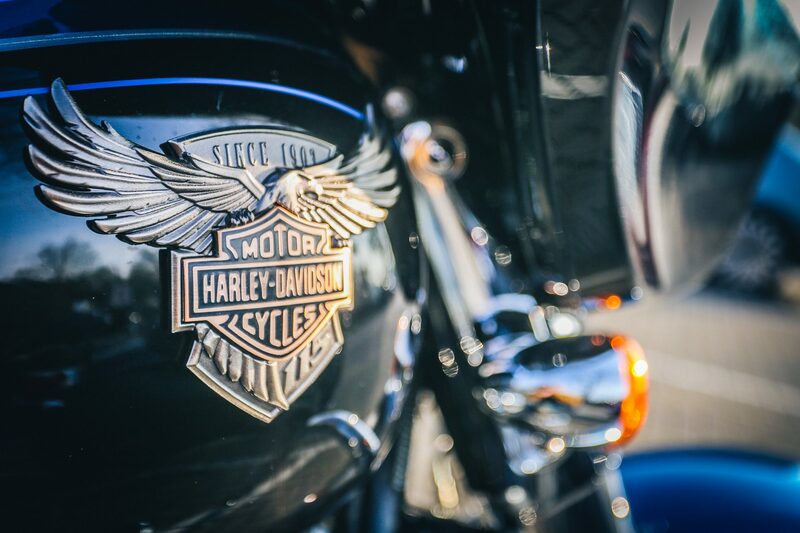 In 1948, the S 125 appeared, the first Harley-Davidson with that succinctly compact tank, which was later to be nicknamed “Peanut Tank” and whose striking proportions inspired generations of Customizern. 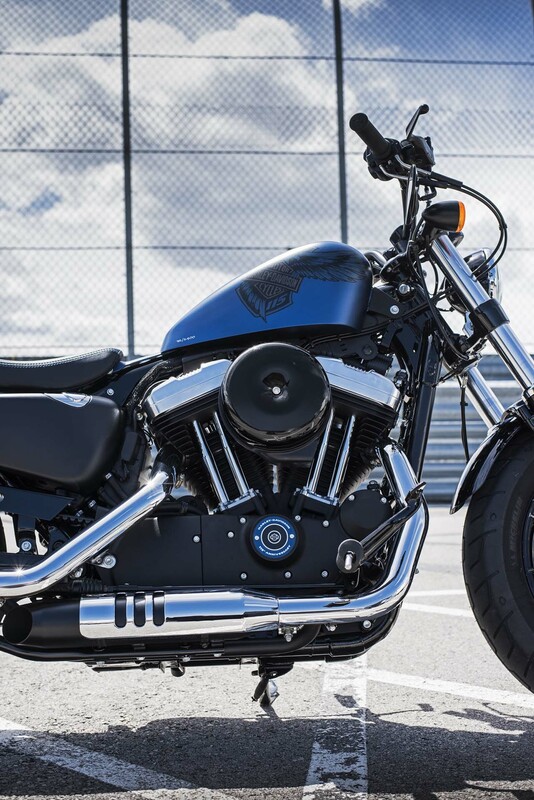 In the tradition of this custom culture is the Sportster Forty-Eight: a stylish bike in the characteristic look of a purist bobber – and of course with a Peanut Tank! 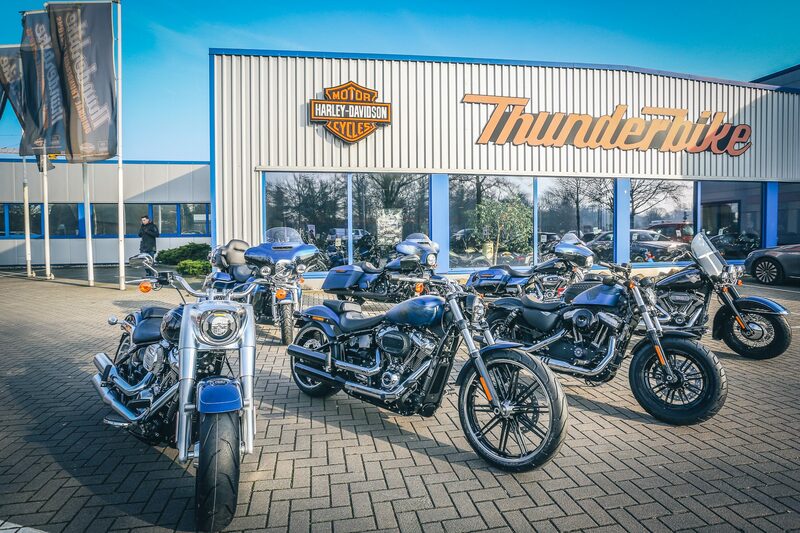 For 2018 – the 115th year in the brand’s history – Harley-Davidson also offers the top seller Sportster models in this anniversary edition. The 115th Anniversary Forty Eight has all the advantages that are already featured in the standard Forty Eight. 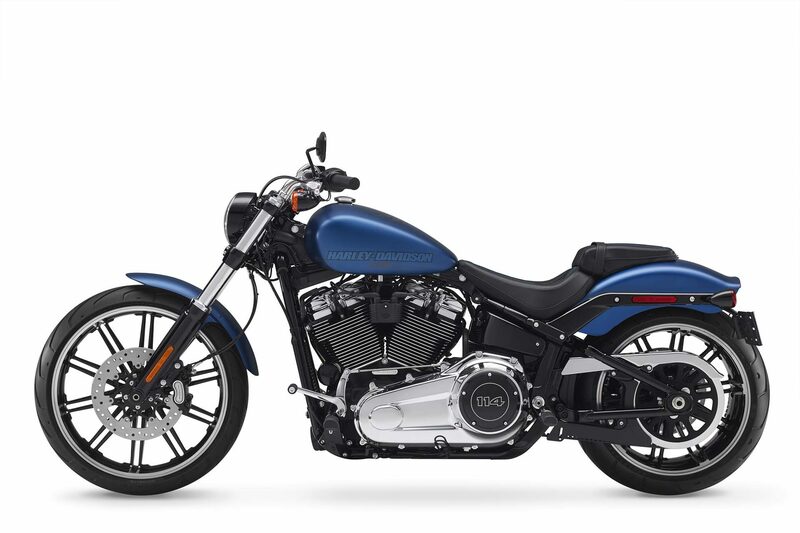 In addition, it is in the new matt varnish Legend Blue Denim, which is reserved for the anniversary models. The tank’s right flank is adorned with an asymmetrical tattooed eagle with a Bar and Shield logo in its claws. 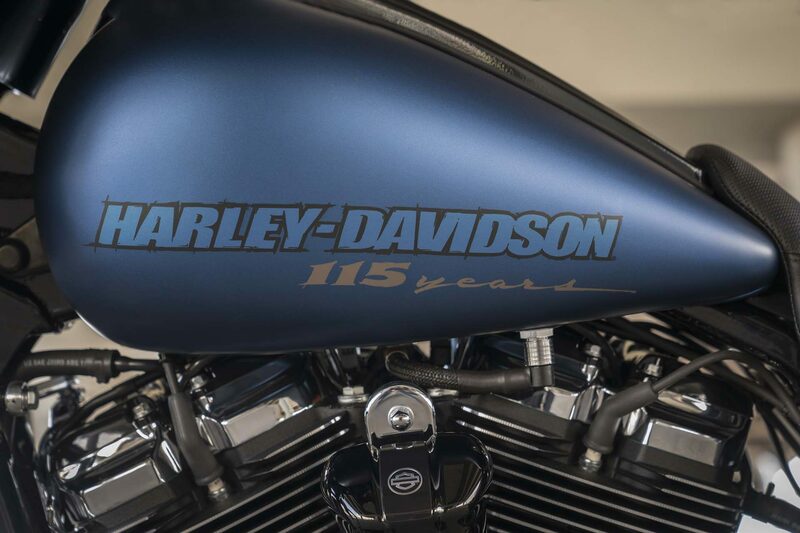 The left half of the tank presents the “Harley-Davidson” lettering with reference to “115 Years”. As with all anniversary models, the slim seat is perforated and equipped with blue stitching. The ignition cover was finished in glossy black with a blue trim ring and a lettering that points to the 115th anniversary. Each machine is marked on the tank with a serial number. The driving experience on the 115th Anniversary Forty Eight is in no way inferior to its exclusive look. This is guaranteed by the 1202 cm3 black, powder-coated Evolution V2, which releases 49 kW at 6000 rpm and generates 96 Nm at 3500 rpm, as well as a precise five-speed gearbox with smooth-running clutch. 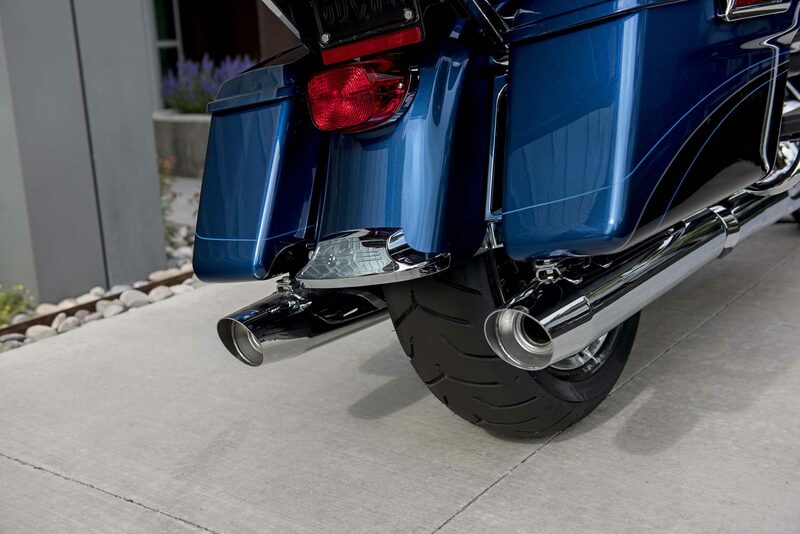 The Shorty Dual Exhaust System produces the matching American V-Twin sound. The heat shields of their mufflers were slotted to allow the underlying black coating to protrude. The low-lying chassis with its wide fork is equipped with light alloy cast spoke wheels under close-cut fenders. On the black 16-inch rims on the front and rear rotate exposed tires, 130 (front) and 150 mm (rear) wide tires. 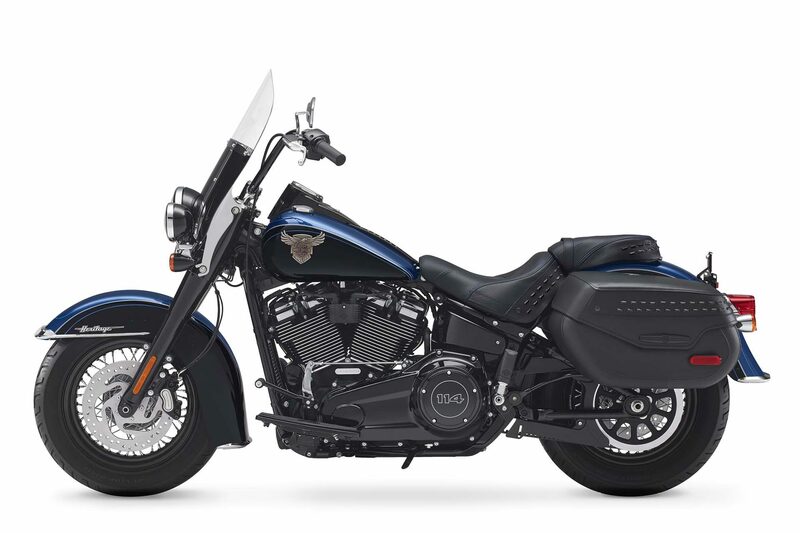 The traditionally shaped 2.1 gallon (7.95 liter) tank is just as influential on the Forty-Eight as its perforated frame cover and solo seat. 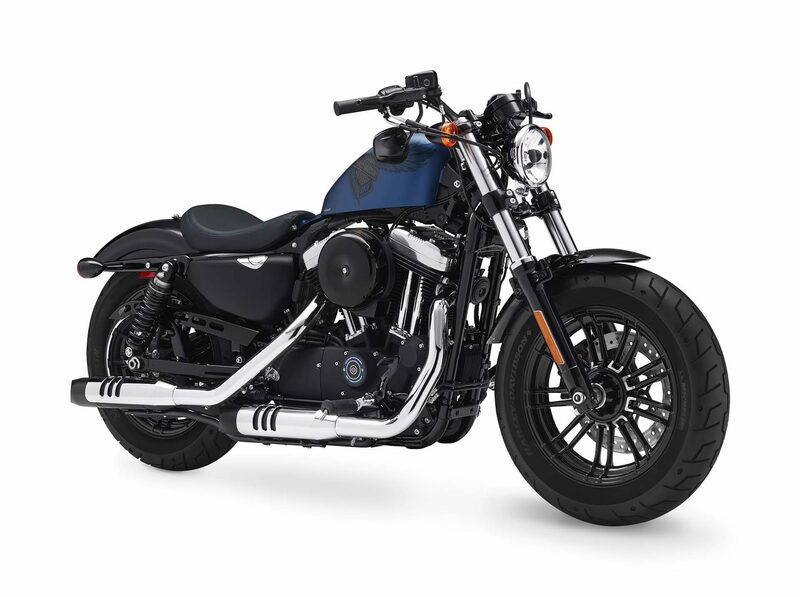 Together with the pre-routed footpegs and the low profile handlebar, the slim saddle contributes to the cool sitting position on the machine. 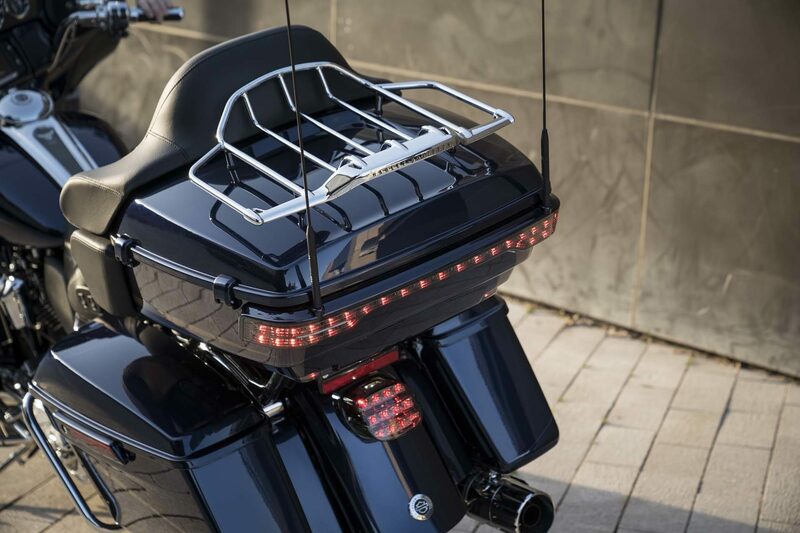 The under-the-handle rearview mirror and fork-mounted turn signals provide an extra dose of custom feel, while the rear turn signals function as rear lights and brake lights to emphasize the minimalist appearance. 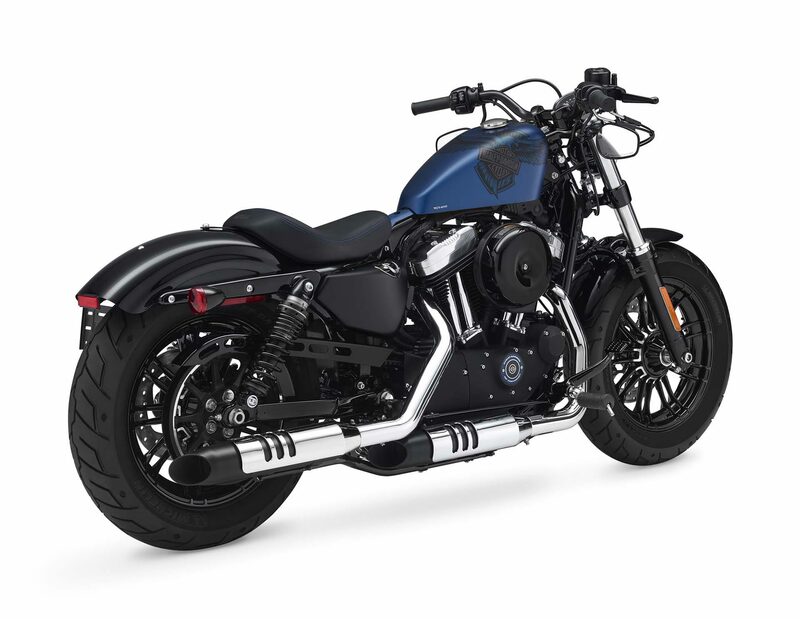 A pillion seat cushion plus foot pegs and a sissy bar are among the many original accessories that allow the 115th Anniversary Forty-Eight to be further customized on request. Their thoughtful as well as practical features include the automatic turn signal reset, the integrated connection for a battery charger, the security system with automatically activating alarm system and immobilizer and the Keyless Ignition System, which makes an ignition key obsolete. The machine is manufactured in an edition of 2400 units. Of these, 625 are destined for markets in Europe, the Middle East and Africa.